Recently I went to a WEA curriculum event and Jol Miskin, the indefatigable exponent of Social Purpose Education, provided copies of a 1949 article on the subject by Sidney Raybould, then Professor of Adult Education at Leeds University. I took advantage of the train ride home to read it through a couple of times and it prompted me to think about what had changed, and what hadn’t, since then. Raybould was particularly concerned about what subjects lent themselves best to social purpose education and addressed a debate between those who believed that social sciences (particularly economics) were the holy grail and the growing influence of provision in arts and humanities. He seemed to be saying that economics (and industrial relations that was beginning to grow) educated people in the mechanics of change, the how, and humanities could provide the vision, the why, if the subject was related to contemporary society. However he reflected a concern that classes in humanities were less rigorous and less likely to attract students active in unions, political parties or voluntary organisations. In discussing this he picks up on a comment by Richard Hoggart (who’d just started in adult education at Hull University) about a ‘pipe and slippers’ attitude to teaching literature. Raybould also picked up on other aspects important to him such as the focus on educationally disadvantaged students (who’d not had a secondary education or, after the 1944 Education Act, were going to secondary modern school.) Social purpose was about understanding society and equipping students to change it. He strongly believed that this required long classes as well as ‘balance’ in liberal education; the tutor should present both, or all sides, of an argument and encourage the student to make up his or her own mind. Whilst Raybould’s article addressed the WEA, the courses he talked about would have been taught by his university staff working through joint arrangements with the WEA. I’ve provided a link to a pdf of the article below so that you can read it and see if you agree with my interpretation. Raybould’s argument is illuminating but he was fighting a losing battle. Social science provision declined in proportion to arts and humanities (that by and large didn’t address contemporary society). In the iconography of post-war adult education, Raybould stood above all for ‘standards’ and in his terms they were declining as courses became shorter and written work was no longer required of students. For him the three-year tutorial class was the gold standard. Social purpose education did remain within trade union education for some time with 3 year day release courses for miners and some other groups of workers in nationalised industries and WEA residential weekend schools providing the main opportunities for manual workers to gain a wider education. Social purpose education had a revival (albeit in a quite different form) in the 1970’s and 80’s linked to social movements such as second wave feminism, community development, tenants’ struggles and workplace health and safety. International influences were significant, particularly from liberatory literacy movements in Central and Latin America. I want however to fast forward to the present day as there is a revival of interest in social purpose education in the WEA and elsewhere, for example at Northern College. Back to Yorkshire again and a video clip in which a range of tutors talk about what social purpose education means to them and their students (link below). Watching one can see that the thread linking understanding the world and changing it remains central. The tutors refer to students engaging with society, the impact on the wider community and awareness of issues we should be campaigning on. But there is no common subject, or group of subjects, comparable to the earlier debate about Social Sciences and Economics. The students come through different courses like family history, parenting, archeology and cookery with the tutor finding the connection between the subject and wider social concerns and action; for instance between cookery and fair trade in food products. The feel is authentic and more personal, diverse and tentative with an underpinning of building confidence, awareness and skills to support greater community engagement and social action. The ethnic and national range of the student groups bring a global perspective to the local community within which the course is located. So what’s changed and what hasn’t? It could be argued that in the late 1940’s there was a shared paradigm within which social purpose adult ed operated. There were millions of working class adults who had been denied a full secondary schooling (let alone HE) and 80% of the next generation were heading for secondary modern schools under the 1944 Act’s tripartite system. Trade unions, political parties and activity (nationally and locally) and a strong civil society offered a range of mechanisms to get involved in social and political change. And there was a wide-spread assumption that political action and economic management could ensure that never again would the poverty and inequality of the 30’s be experienced. Today’s society is much more diverse, fragmented and uncertain; there is less confidence and participation in political parties (and more parties too) and mediating organisations, most notably trade unions. They have lost influence and support whilst campaigns and single issue pressure groups have grown. Digital communications and social media are transforming the campaigning landscape. The context is highly complex but immensely rich. Whilst many students value the local there is a continual interplay with the global; the tutor who talked about learning from students from Mexico and Slovakia echoes a frequent experience. Raybould refers to the vagueness and lack of clarity surrounding the meaning of social purpose education despite, according to one contemporary WEA writer, its ‘undoubted emotive merits’ . There is today some excellent social purpose practice in the WEA and elsewhere; the organisational challenge will be to develop this in a coherent, consistent, exciting and well evidenced fashion. 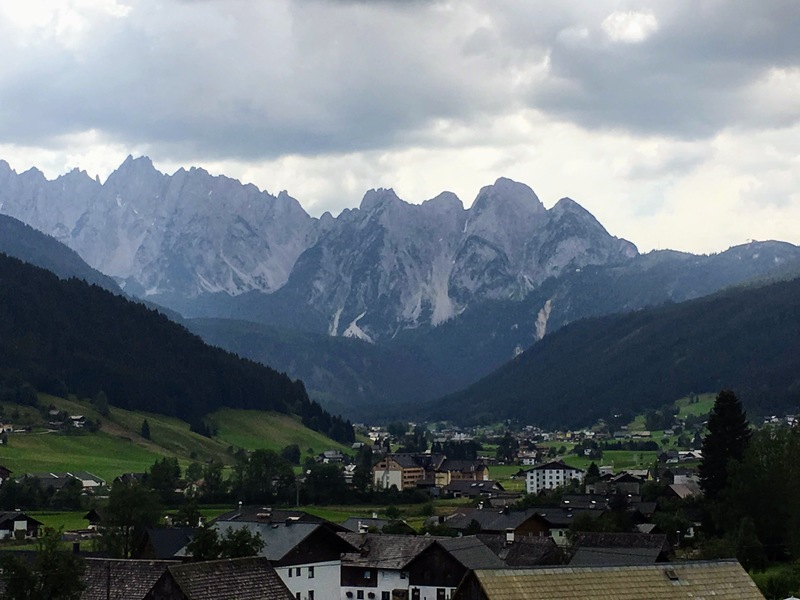 Dachstein is a splendid massif in the Northern Limestone Alps with a range of striking jagged peaks many over 2500 metres high. 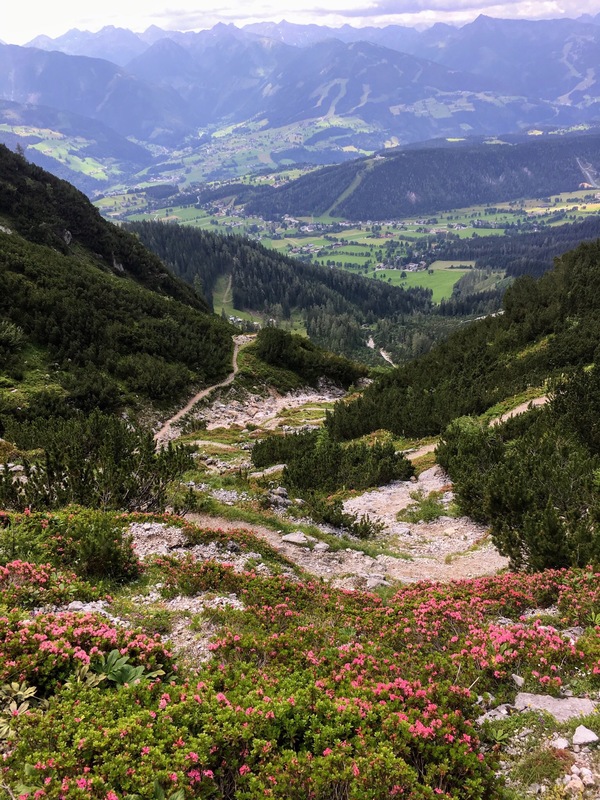 The Dachstein circuit is a well way-marked trek, often done over eight walking days, that embraces the diversity of the area. 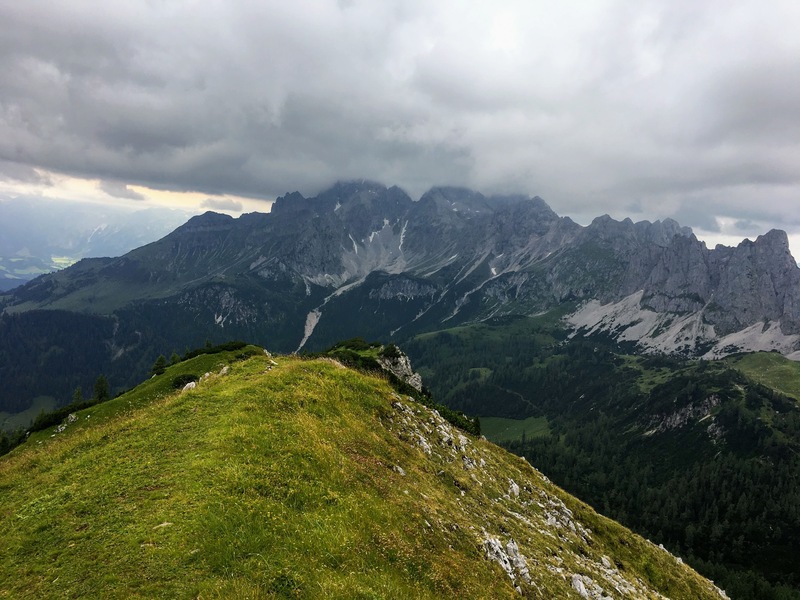 There is classic high mountain walking – often over 2000 metres – as well as many wooded areas, meadows and pastures, valleys and riverside routes. The circuit is graded ‘moderate to strenuous’; there are plenty of long ascents and descents mainly following clear zigzagging paths, with a small amount of scrambling and occasional passages over snow and scree. The main challenge comes with weather. After and during rain it can be treacherous underfoot continually watching out for slippery mud,stones and ubiquitous tree roots. Distance in kilometres is not much of a guide as so much depends on the terrain but signs provide an estimate of time to reach destinations. The stages we did were all doable (rough times provided on day by day guide below) usually leaving about nine in the morning and arriving between four and five in the afternoon. By the way I won’t see my 70th birthday again so you’ll need to adjust for age. Paths are well signed giving both the path number (as shown on map) and estimated time to reach key destinations. It’s not a ‘challenge walk’ and quite commonly walkers ride on a bus, ferry or train for a few miles, or take a cable car either to save time or cope with bad weather. We did this on several occasions. We did this as a ‘self guided walk’ via MAC Adventure who arranged accommodation and main baggage transport as well as providing a map and guide book. These arrangements worked very well. Accommodation was a mix of mountain huts and hotels or guesthouses. 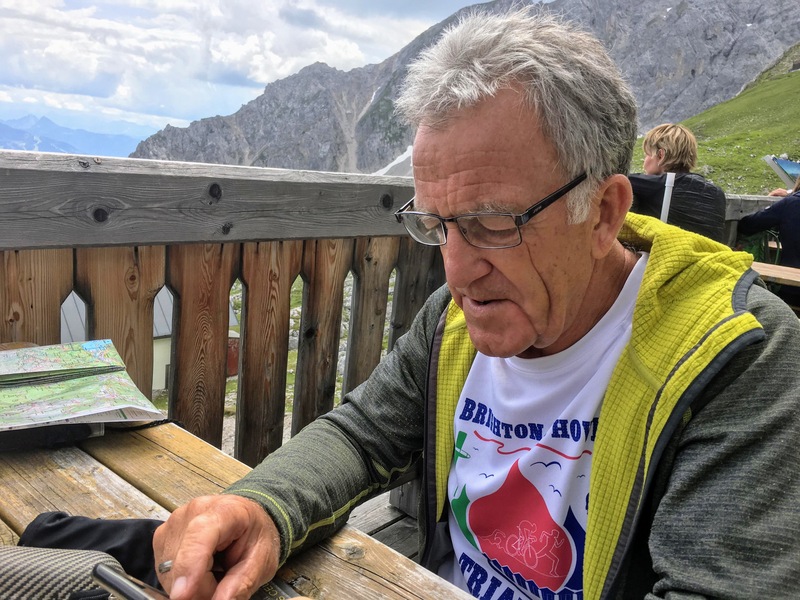 Chris and I did the circuit in early July starting from Gosau (flight to Salzburg and then train to Steeg-Gosau, changing at Attnang-Puchheim, then bus to Gosau). I’ve done a day by day account below to give my impression of each day and some of the highlights as well as to illustrate the variations brought about mainly by the weather. 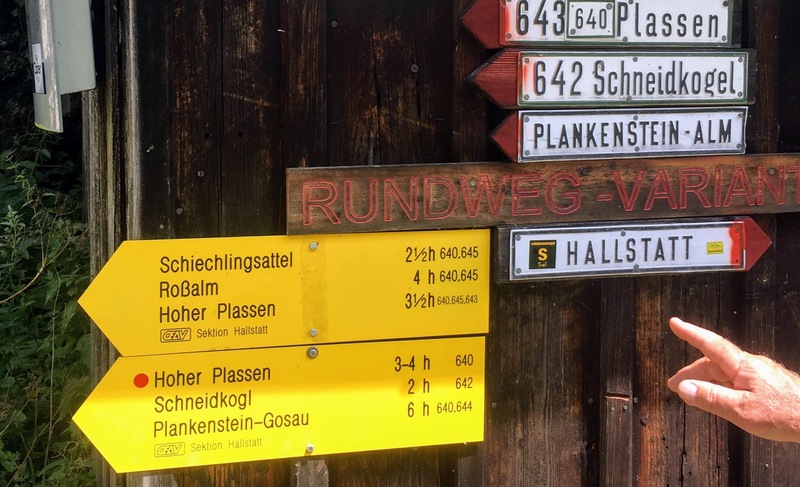 It’s not a guide- you need the map (Kompass 1:50,000 walking map of Dachstein, Ausseerland, Bad Goisern and Halstatt). There is also a guidebook Dachstein Rundwanderweg by Reinhard Lamm (there’s an English version). These were provided by MAC Adventure as part of the package along with instructions for finding our booked accommodation. Getting off the cable car, it was no longer raining and visibility wasn’t too bad. Followed path 618 up a short steepish climb and then through woodland. Recent rain made the path slippery with mud, stones and tree roots. After a couple of hours the route becomes more open meadowlands with views up to the limestone peaks and down; there is a cafe bar at Stuhalm. The walk then skirts the mountain side, descending and ascending on the way with one sharp zigzag climb, helped by wire side rail. Path then becomes easier with great mountain views, we also spotted marmottes playing before reaching superbly located hut. Walk had taken about five hours including breaks. 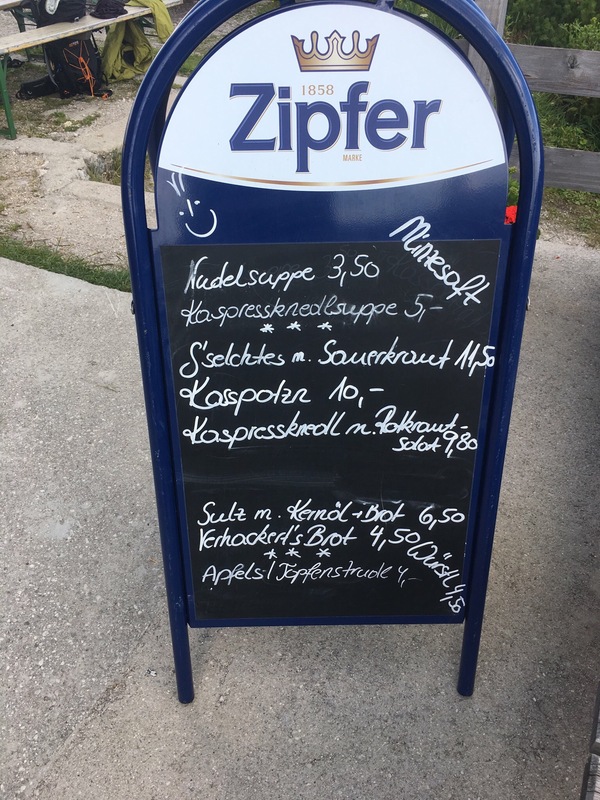 Hofpurghutte is a big and busy hut with cafeteria style restaurant- a decent plate of spaghetti bolognese at €8.50. Hosts like a bit of banter about England’s World Cup chances. No WiFi but able to follow most of England v Sweden via others’ phones and text messages. 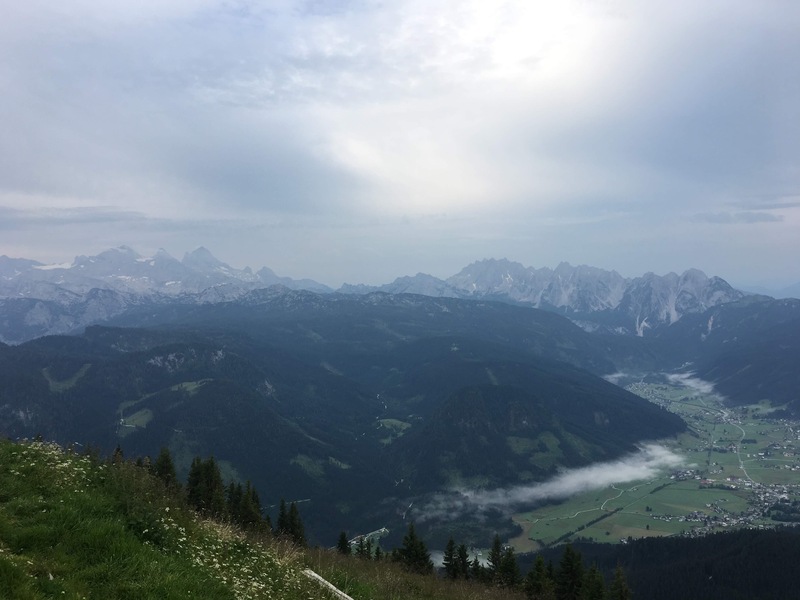 Hofpurghutte to Ramsau: a good start to what should have been an epic day but we retreated early down to Ramsau as the weather deteriorated. 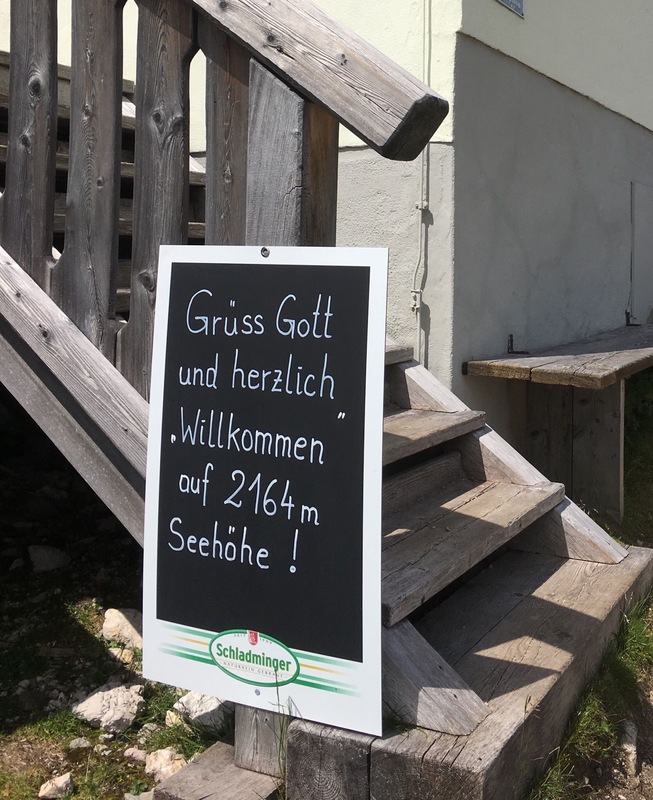 Started well following signs to Dachstein Sudwandhutte; the plan was to follow the circuit to there and then descend to Ramsau for the night. It was enjoyable alpine walking- high up, pine woods but quite open and the path reasonably dry leading to stiff zigzag ascent of Sulzenhals. The summit has excellent views in all directions although clear signs of the weather changing. Carrying on we were met by a group of German walkers retreating from a lengthy passage of scree saying the wind and rain made it too dangerous. We joined them descending to Bachalm and then mountain taxi and bus to Ramsau. Only half a day’s walking and perhaps we’d been too risk averse? 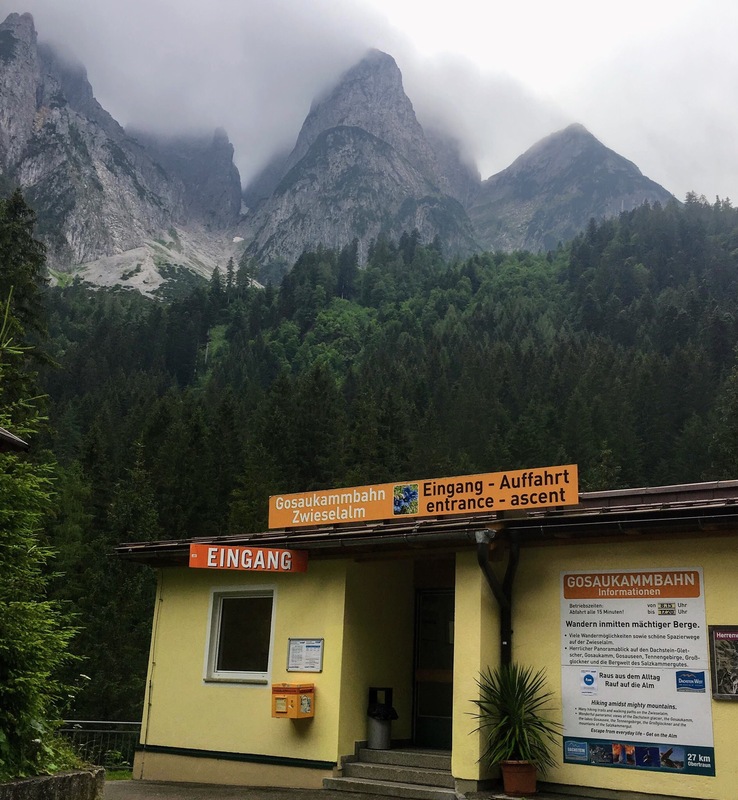 Ramsau to Guttenberghaus: Still low clouds higher up and the hotel manager told us the cable car (Gondola) up to the Dachstein Sudwandhutte was not running because of the weather. We later heard that this wasn’t the case and we’d uneccessarily missed a key part of the circuit, across the glacier. The alternative was a walk along the valley and then a 1000 metre ascent. The climb was steady, for me tiring, and the weather improved greatly. 4-5 hours of walking but I did take it pretty easily! Again the refuge was superbly located, a wooden building that was originally built 104 years ago although substantially extended and refurbished in the meantime. A very congenial host, good range of food and drink, and lots of historical photos and artefacts displayed around the hut all helped create a special atmosphere. At 2164 metres it got pretty cool though when the sun went down. Guttenberghaus to Stoderzinken: today was probably my favourite day’s walking. 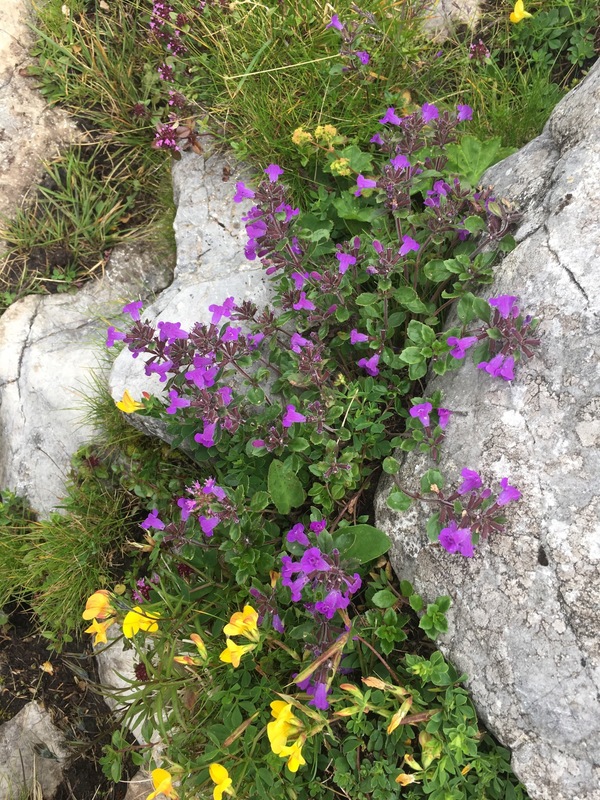 It began with a short ascent/scramble and then 2-3 hours of classic alpine walking at over 2000 metres; Bracing fresh mountain air, eat views on a clear sunny morning and a decent stoney path with a few challenges: some scrambling and crossing scree and snow in places. After about four hours we stopped for lunch at a mountain cabin that served tasty home made goats’ cheese with drizzled olive oil and herbs. The remainder of the walk, with ups and downs, was mainly through woods so the atmosphere was closer and there were fewer views before arriving at Brunerhutte and then up to Stoderzinken, mainly a winter sports resort. The walk had taken just over seven hours in total. In the morning there was rain and low cloud but the route mainly descended so we stuck to it. 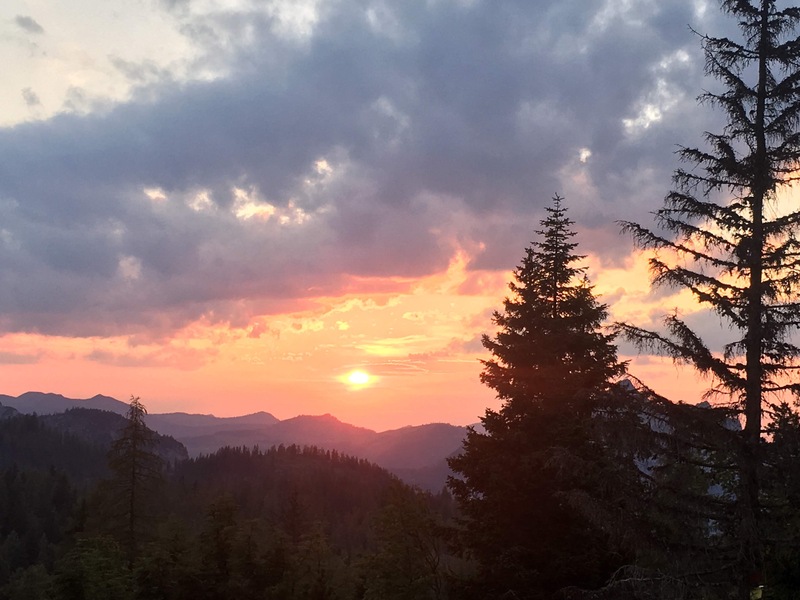 It initially doubles back on the previous day for about 45 minutes before turning off to Notgasse and going along an ancient mule track through a steep-sided ravine (up to 60 metres on either side). The conditions- steady rain, low cloud, high wet undergrowth and treacherous underfoot- meant you had to concentrate on keeping going rather than appreciate the ‘magic and mystery’ of this trail once used by farmers, merchants and charcoal workers. We weren’t either able to see the ancient carved rock art, upto 2000 years old. 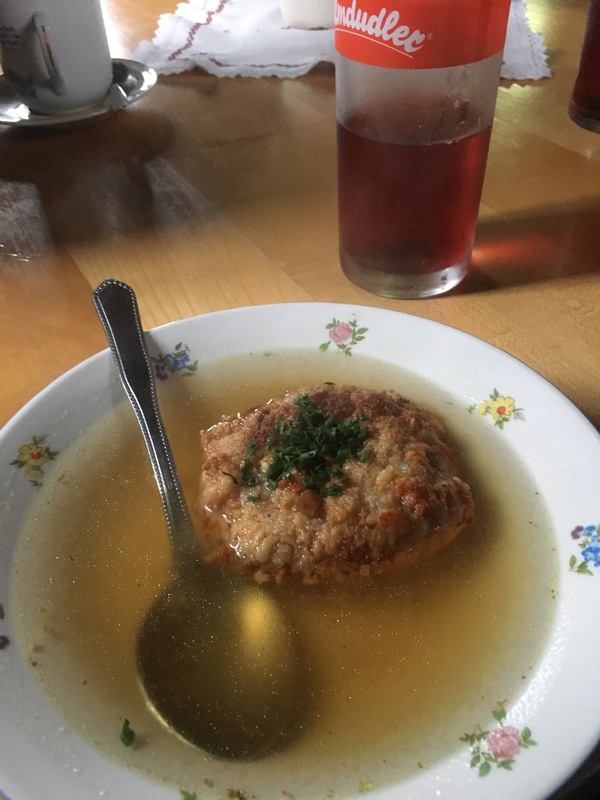 Continuing we stopped at the isolated village of Viebergalm and were able to appreciate a warm room and a bowl of clear soup with a substantial cheese dumpling! 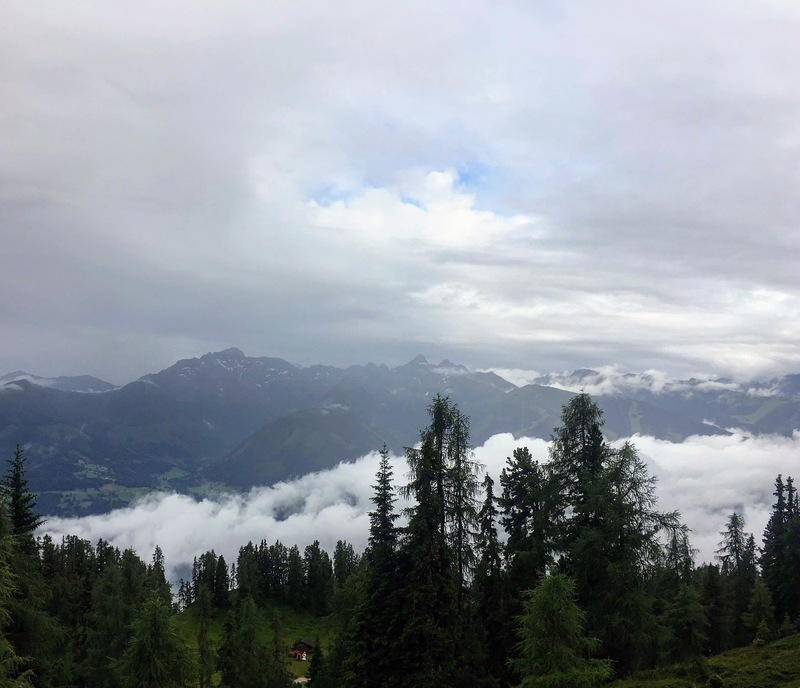 Soon though it was back to the trail and a wet, wooded climb upto the summit of Hochmuhleck (1738 metres) followed by a long descent that began quite trickily but gradually became easier finishing up on forest tracks. We got to our guesthouse in Knoppen at 5.45pm having started nine hours earlier. I won’t lie; it was hard work mainly because of the weather but it was nice to be welcomed on arrival by American friends we’d got to know over the previous few days. Skip and Amy work at a not for profit university in Seattle and we talked a lot about treks (they’d done the English coast to coast about the same time as us) as well as the usual Brexit and Trump stuff! The evening ended with the disappointment of England’s World Cup defeat to Croatia. This was the longest distance of the day’s – just over 16 miles but mainly on the level with a good walking surface. 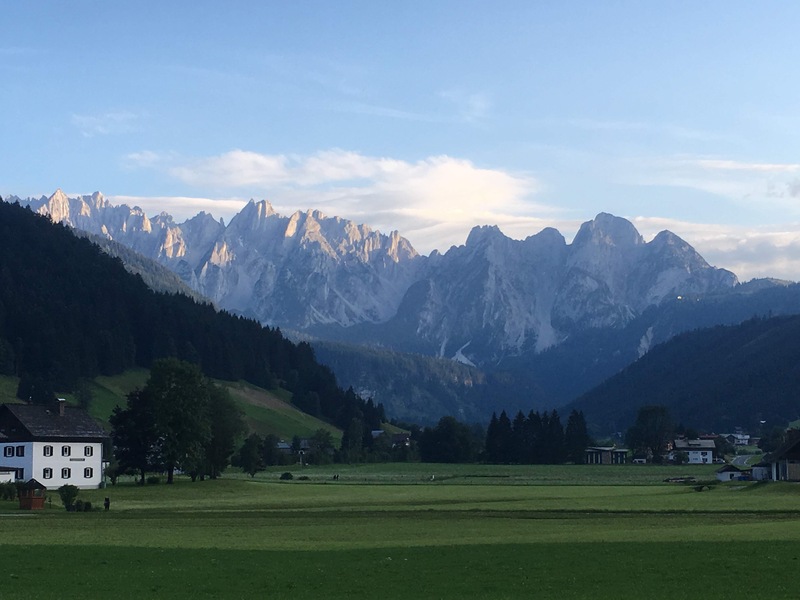 There is an option to take a bus to Bad Aussee and walk from there but we decided to walk it all; it was forecast to be a sunny day and there was plenty of interest on the way and it wasn’t too strenuous. We doubled back for 30 minutes to rejoin the trail and then along to Odensee an attractive lake set in woods and popular for fishing, swimming and boating. Then on to Bad Aussee to continue the trail along the river Traun. 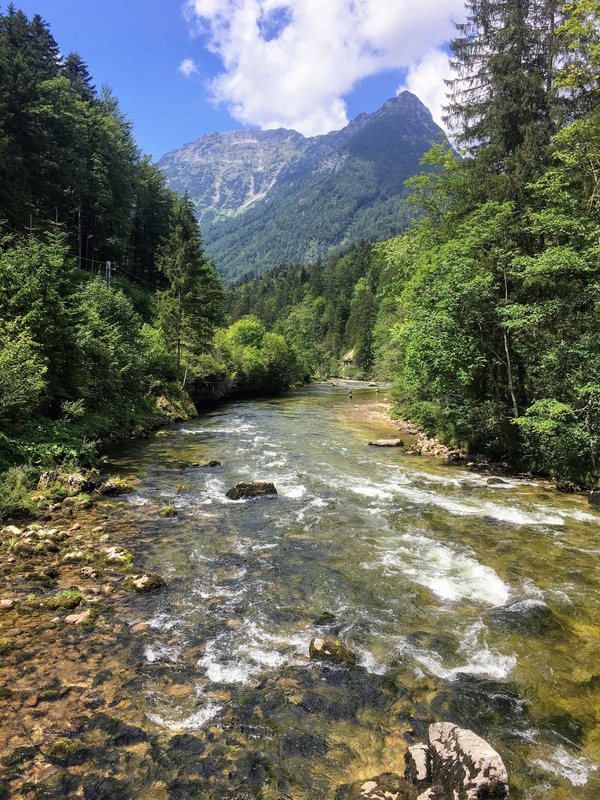 It’s a longish stretch to Obertraun where we were to catch the ferry to Hallstatt but good walking- few ups and downs, decent surface, mainly shaded and alongside the river with the mountains in the near distance. There is a cafe restaurant en route. The walk ends skirting Obertraun and ends at Hallstattsee ferry stop. Seven hours walking and in good time for the last ferry at 16.40. It’s a twenty minute trip across to Hallstatt with great views across the lake both back to Obertraun and coming into Hallstatt. 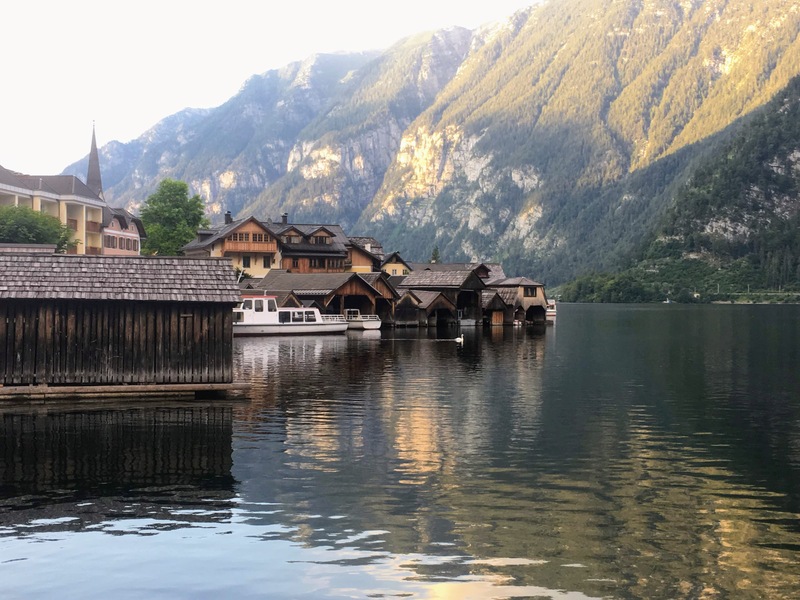 Hallstatt: we decided on a rest day here when planning the trip and were glad we did. Admittedly Hallstatt is a massive tourist hot spot packed during the day so it’s a bit of a change from the mountain stages. It’s particularly popular with Chinese visitors. ; in fact there’s a replica Hallstatt built in the Guangdong province of China. What’s its appeal? It was one of the first human settlements and has a long and rich history stretching back to the Bronze Age (a large Bronze Age burial site was discovered in the 19th century). 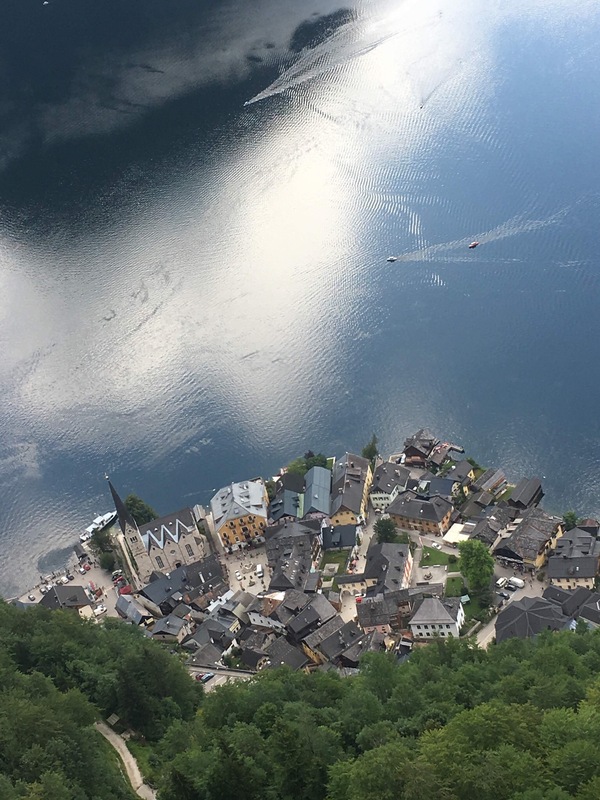 The mining of salt formed the basis of Hallstatt’s economic importance as a trading centre. 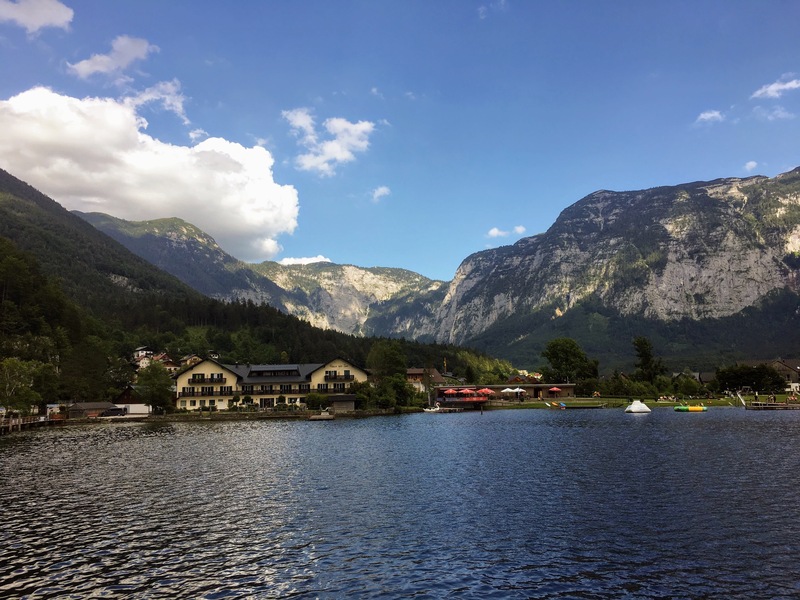 By taking the furnicular or path (300 metres+ of ascent) it’s possible to visit the burial site and the salt mine as well as get great views down to Hallstatt. 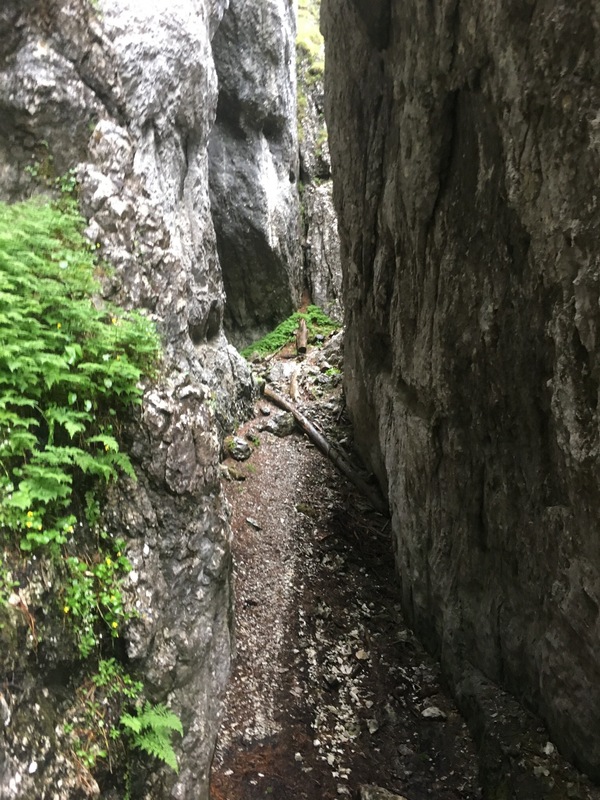 The trail proceeds along the Brine-pipeline; this was first put in operation in 1607 to take the brine from the mine to a salt factory in Ebensee and a gently descending trail accompanies it. Unfortunately the trail is closed for summer and autumn of 2018 following storm damage so a key part of the walk was missed. Instead we took the train to Bad Goisern and picked up the trail there. 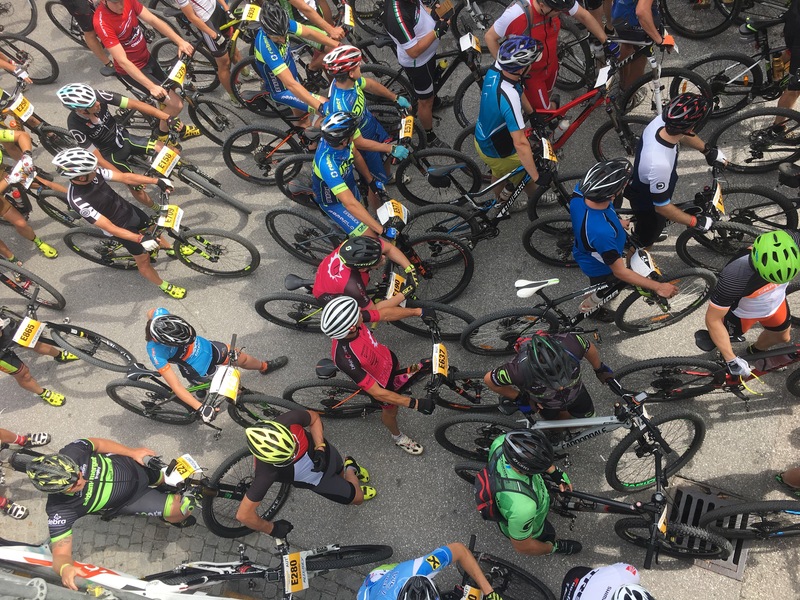 As compensation we did witness part of the start of the Salzkammergut mountain bike trophy that is known as Europe’s toughest mountain bike race: five thousand competitors competing over a number of different distances. The ‘adrenaline junkies’ can do a race of 210km with 7119 metres altitude difference. The walk up to Goiserer Hutte (1000 metres of ascent) took me about three hours- a steady climb starting with road and forest track and then stoney path with fine views down to Bad Goisern and the valley. The hut was originally built in 1932/3 and had recently been refurbished and was very well maintained and served first class food. 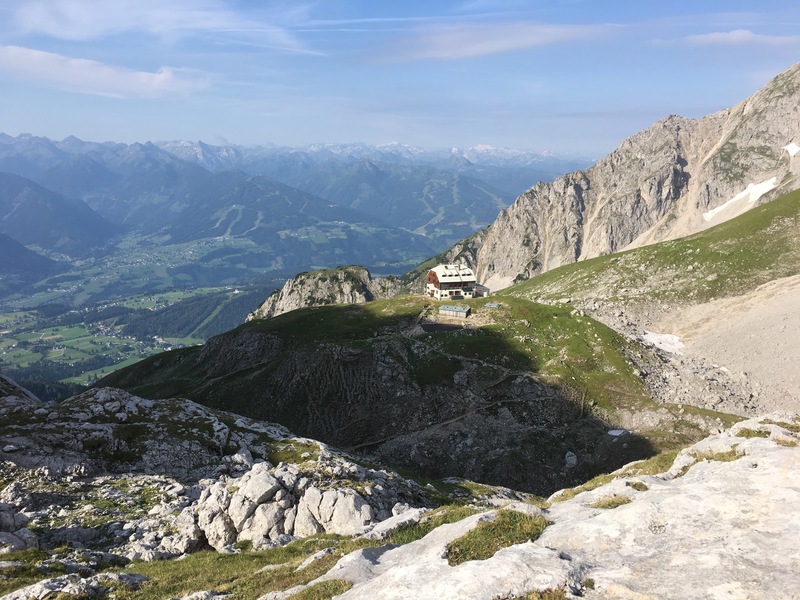 The hut is superbly located with great views but to get a 360 degree view including across to the high Dachstein, the thing is to ascend the summit of nearby Hoch Kamberg (1833 metres) that takes about 45 minutes. We did this in the early morning and it was well worth it with great views in all directions in the early morning light. 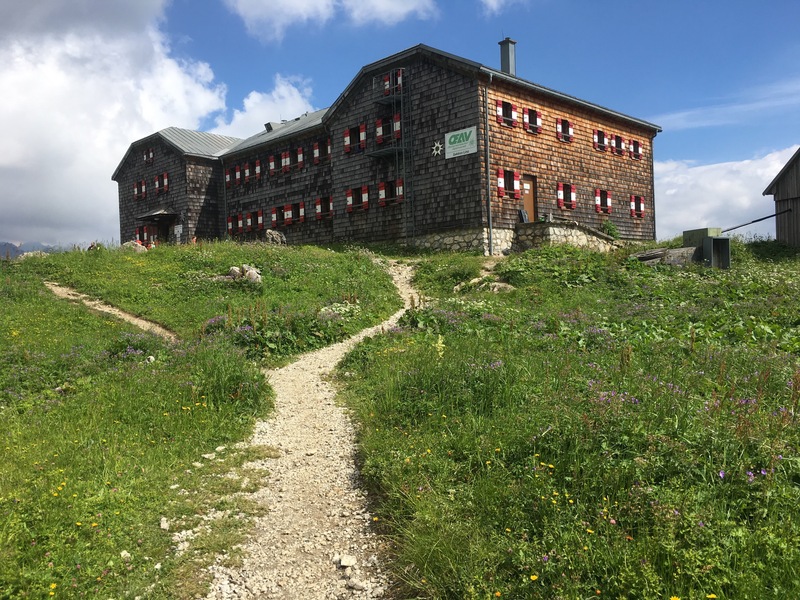 Back to the hut for breakfast including a local blue sheep milk’s cheese and proper salami, not luncheon meat plus limitless supply of coffee and then off on the last stretch- the descent to Gosau. This began through an open wooded pastoral area and gradually became more densely wooded before following a road into Gosau, where it started to rain. About three and a half hours walk and the circuit was completed and all that was left was to watch the World Cup final. 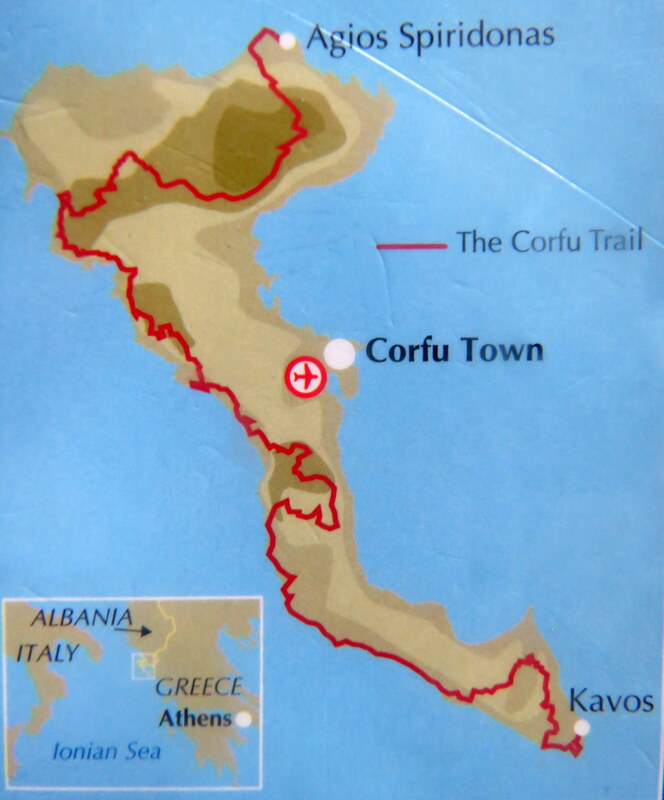 I’d never been to Corfu before but the Corfu Trail (CT) seemed an ideal way to visit the island without being stuck in one resort so my good friend Chris and I decided to give it a go this June (2017). Corfu is one of the larger Greek islands – roughly 40 miles long and 20 miles at its widest point. The CT – see map – initially goes west-east-west then up along and near the west coast before circling round and up the mountainous and wider north. The western coast is always interesting: hilly with jagged bays as well as some longer beaches. From a few hundred metres up there are great views across the island with views of villages, woodland, the coastline and the Ionian Sea to the west and the straits across to Albania to the east. The island’s capital, Corfu Town (Kerkyra) often comes into view from different angles. We greatly enjoyed it and would recommend CT to others who are fans of the Mediterranean and like the idea of mixing walking through quiet woodlands, olive groves, orchards and hill villages with busy coastal villages and resorts, and plenty of really attractive beaches and bays. The trail is officially 92 miles although longer in practice allowing for intentional and unintentional detours. It was devised in 2001 and like many long distance walks (such as the French GR’s) cleverly links together established paths and tracks between valleys and inland and coastal communities to provide an interesting, varied and – at times – challenging route. It was designed partly to attract walkers to the islands especially during the quieter times in the season. In June, the main challenge was the heat – 30+ degrees every day – and the main walking seasons are April and May, and later in the year- September and October. However the long days, warm sea and blue skies made it well worthwhile. 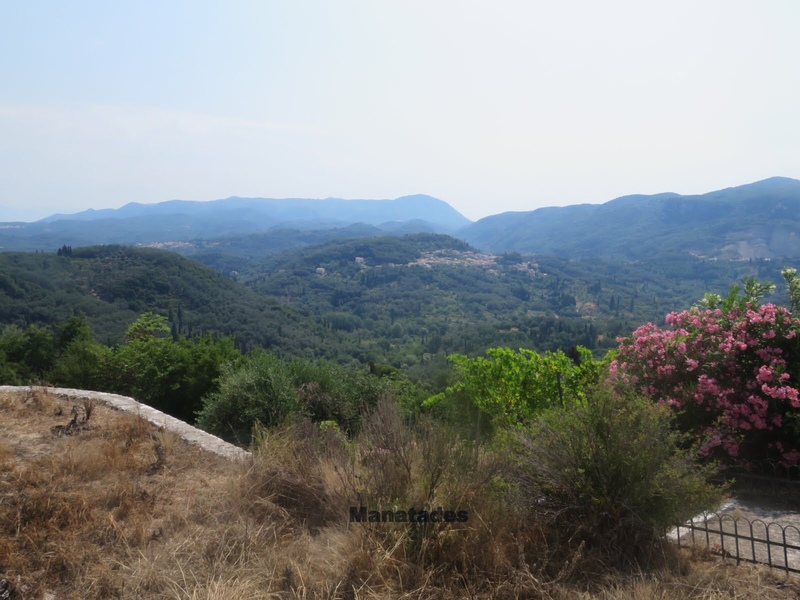 Corfu is green and hilly so the walk goes up and down but, other than the last day, rarely goes higher than 300 metres so the ascents are not too lengthy. The views are fantastic across to the sea (sometimes to East and West from the same point) and looking back at the villages and hills of the day’s walk. To the left is the view south west from Pelekas, an inland hill village. Much of the trail follows the west coastline from the busy resort town of Kavos, with cafes offering a full English breakfast for 2 or 2.50 euros, past more remote beaches (see Chris crossing Arkoudilas beach a few miles from Kavos), smaller coastal villages set in steep sided bays, and larger resort villages with plenty of hotels, restaurants and cafes. June is mid-season so there’s plenty of room to eat and bathe. 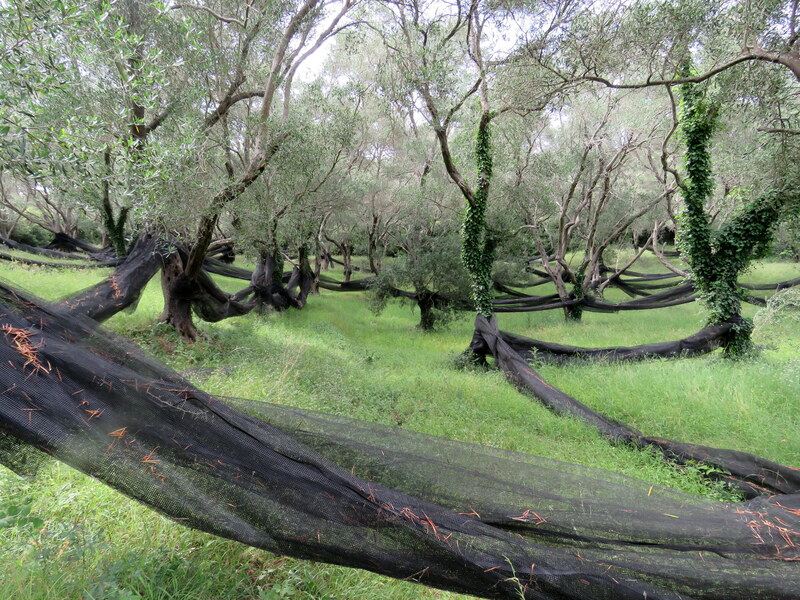 Often you walk through olive groves (netted in preparation for harvesting). There are an estimated 3 million olive trees on Corfu; it was the main activity before the rise of the tourism that is now the island’s main industry. Villages on the route provide a welcome break and a quiet contrast with the coast. 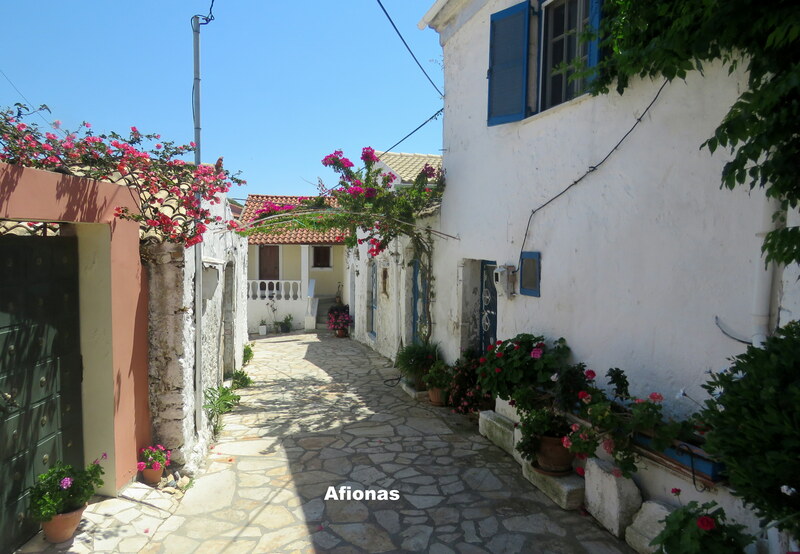 The picture illustrates one, Afionas, at its most picturesque; beautifully kept and with lots of flowers standing out against whitewashed walls. In some villages this exists alongside signs of depopulation and some of the strains on Greek society: abandoned cars, half completed buildings and uncollected rubbish. We completed the trail in ten days with a mix of longer and shorter days walking. Prologue: arriving in good time at Asprocavos (just south west of Kavos) we walked up to the remains of the Monastery of Arkadoulis: a brief (4-5 mile circular walk) which introduced the area with views to south and east. Asprocavos to Santa Barbara: this was the longest day – over eight hours walking and just over 20 miles according to my fitbit! Along Arkadoulis beach with a detour round the headland as the road to the beach had collapsed. 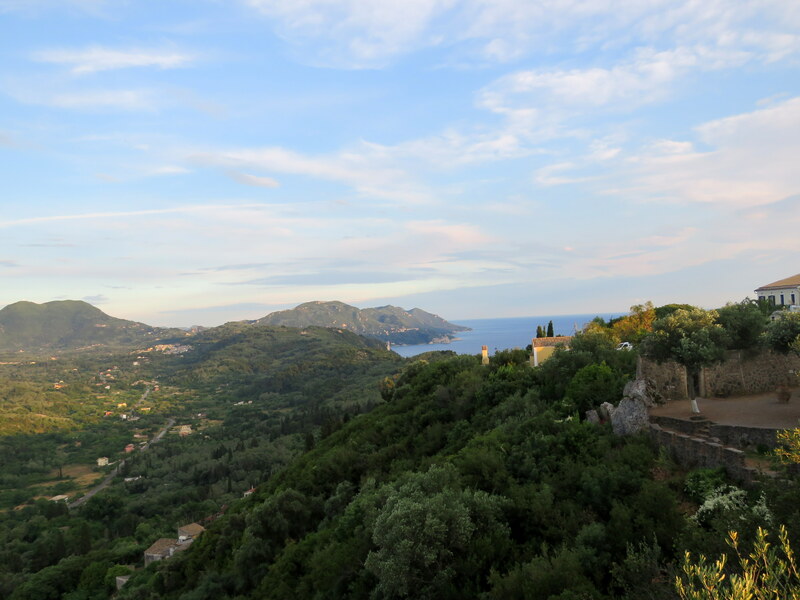 Through Spartera and then through olive groves to Lefkimmi, Corfu’s second largest town. From there back to the west coast again through olive groves to Gardenos followed by a stiff climb and descent above the coast and ending with a beach walk in Santa. Some people split this stage in two, staying in Lefkimmi. Santa Barbara to Paramonas: it was June 9th so got up this morning to see that ‘Britain wakes up to a hung parliament’. Cheered us up no end and plenty to talk about en route. Walked along the beach through the resort village of Agios Georgios South and then back on Issou beach before finding (after some false starts) the path through to Lake Korission and round along the spit between the lake and Halikounas beach. I was a bit disappointed with this stretch as the lake and the sea were hidden by high bushy undergrowth. Walked round above Alanoki Bay (picture) and then through olive groves in the shadow of Prasoudi mountain to reach Paramanos, a small coastal village; great swim from the beach- the sea on west coast is choppier and cooler but so clear and a beautiful setting. The owner of the guest house picked and gave us the sweetest and juiciest apricots I’ve ever tasted and the restaurant by the beach boasted the best sunsets. Paramonas to Benistes: today we crossed to the East coast leaving the trail at Dafnata to get accommodation at Benistes. Started with a steady climb up the side of Parasoudi mountain and then down to the hill village of Ano Pavliano- well ready for a lemonade break. 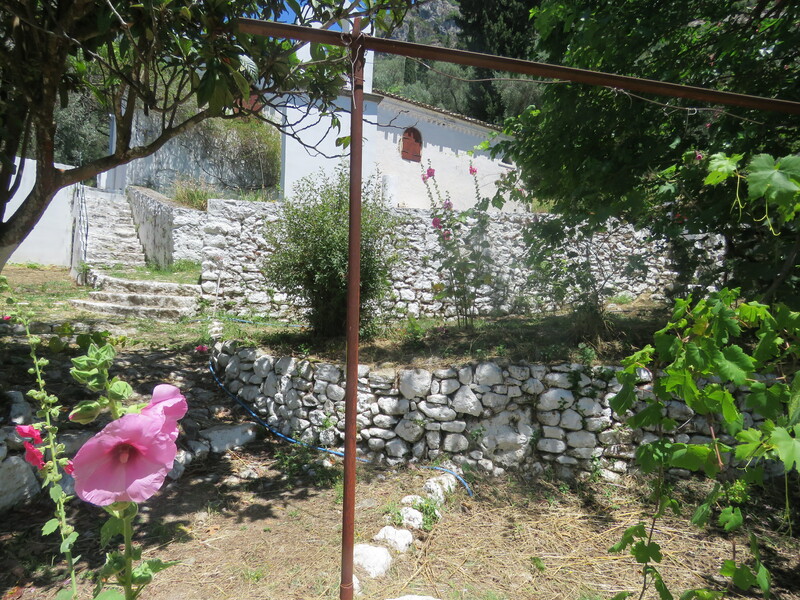 Carried on through Vouniatades towards Strongili, passing a small church with a terraced garden (picture) and on to Dafnata having a ginger beer there and chat to the café owner, Kostas, a big Corfu Trail man and used to work with Alex Ferguson. He keeps the antidote for viper bites and should be phoned if you’re bitten. Then down hill to Makrata and then the track to the east coast resort of Benistes for the night. We’d been through Benistes driving from the airport to Kavos; like much of this stretch of ribbon development on the east coast it was busy, with scooters, mopeds and quad bikes buzzing around and very much geared to the tourist trade. Benistes to Pelekas: taxi to Makrata to re-join the trail. Good days walking with excellent views especially towards Corfu Town. Went through Agio Deka and Kamara to Sinarades where the rain came down. Sheltered for a while then cooler walk up to the hill village of Pelekas where we stayed at Jimmy’s Taverna. The rooms here are quite basic but it’s a popular stop as the food is varied and very well prepared. I had numbulo salad (smoked ham from pork fillet) followed by local sausage with mustard, washed down with half a litre of retsina. 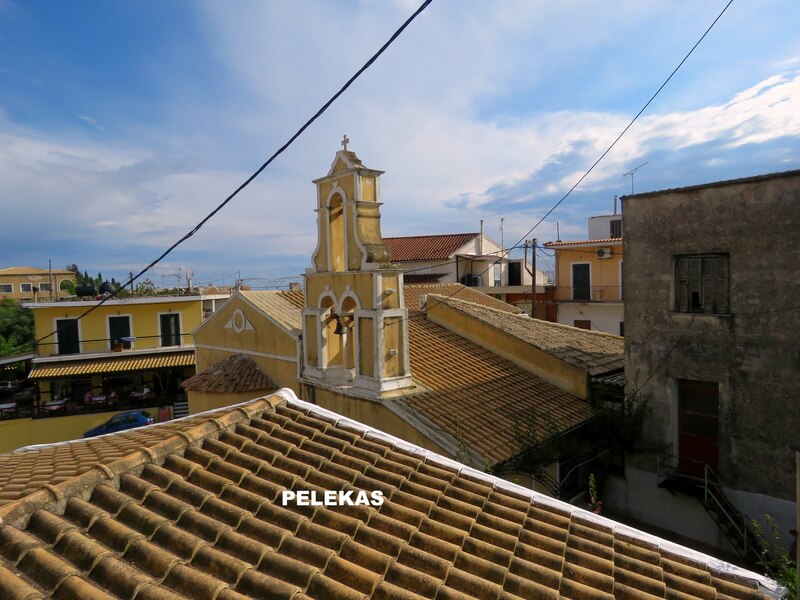 Pelekas to Liapedes beach: another long day’s walking starting by going above the renowned Mirtiotissas beach, past a splendidly maintained monastery and then a steady climb across Agios Georgios mountain before descending into Kelia and then Vatos (lemonade break). From there along the Ropa valley and up to Giannades for a lunch break – fruit and chilled ‘Liptons’ outside the local mini market. The remaining walk was mainly through olive groves getting to Liapedes and then down to the beach in good time for a swim. 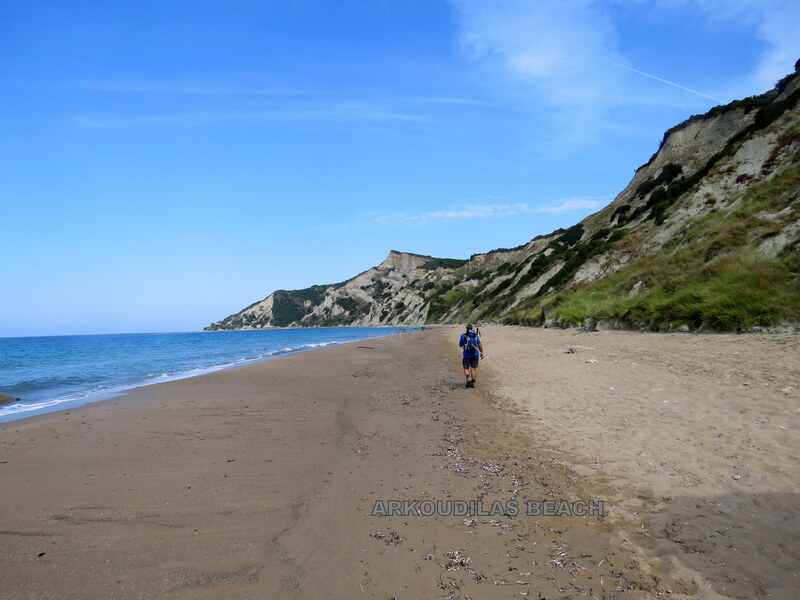 Liapedes Beach to Agios Georgios north. A shorter day but started with a stiff climb up to Lakones that stretches along the road, crowded with visitors and buses, and looking down to the monastery and many coastal developments below. Then through olive groves and the village of Krini and the first glimpse of Agios Georgios north reached by following the kalderimi, an ancient stone track cut into the side of the hill. Agios Georgios north has a splendid beach and plenty of hotels and was the place for our rest day. Rest day: round walk to Afionas and Porto Timono: strongly recommended for today was a trip to Porto Timono where two bays meet at the headland beyond Agios Georgios north bay. This involved a road walk up to the finely manicured village of Afionas and then a tricky descent down a well used path to the bays. Agios Georgios North to Rekini: a shorter walk today to catch a lift down to the resort of Roda for accommodation. Along the beach and then an ascent to Pagi, down and up again to Asprotades, Manatades (pic below) and Agros. Stopping there for a lemonade, the cafe keeper was a lover of mountains and knew Albania whose formidable mountains can be seen clearly from Corfu. He was (justifiably) surprised that we thought Roda was a fishing village! It isn’t; it’s a pretty tacky resort town. Anyway we continued the walk to Rekini and picked up our lift to Roda. 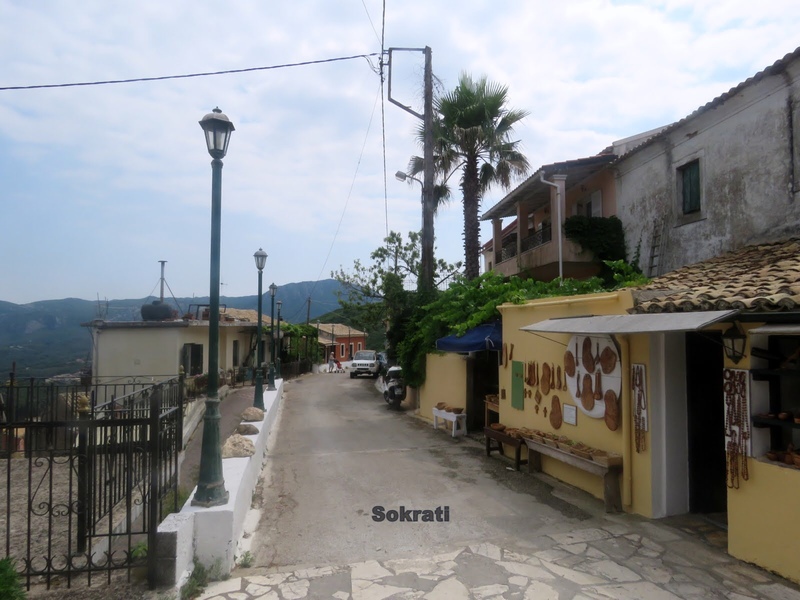 Rekini to Spartillas (then dropping down to Barbati for accommodation): a hilly day’s walking through the villages of Valiano and Sokraki (pic below)- stopped here for a ginger beer; an attractive but quiet hill village. Continuing we walked along a fertile valley with vineyard. Earlier a farmer harvesting apricots had given us a couple of handfuls. Although vines and fruit are important products, up till now it had mainly been olive groves that we’d seen. Continued to Spartillas and then a quiet winding road down to Barbati for accommodation. The sea was beautiful- a stoney beach but clear and warm water. mountainous terrain: bushy undergrowth, rocky and uneven but a well marked trail that took us to a track below Mount Pandakratoras. The trail skirted round the mountain before heading north and down to Old Perithia pic below. Old Perithia dates back to the Middle Ages and at one time was a prosperous farming village with more than a thousand inhabitants. Once deserted it’s been revived- with EU money- and is a popular spot with plenty of cafes and restaurants. We stopped for a fresh iced lemon and ginger drink and a slice of orange cake. island: Cape Agia Ekaterinis. The coast line here is wilder and less developed and there are good views back to the mountains. 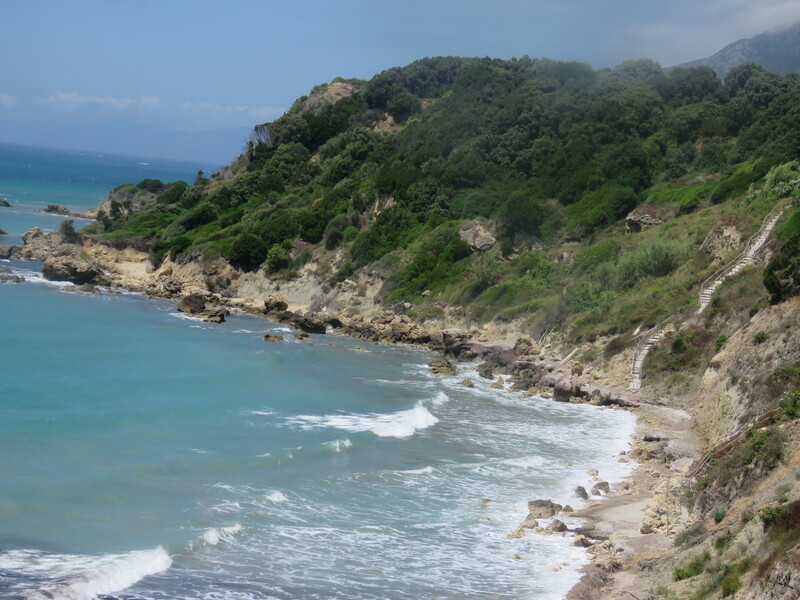 The trail concluded a couple of miles later at the village of Agios Spridonas, named after the patron saint of Corfu. So that was the walk done and time for an ice cream, lemonade and a swim before a lift into Kalami and the night’s accommodation. Epilogue: we spent a further two days on Corfu staying at Kalami: a striking coastal village with Durrell connections- the White House is now an upmarket restaurant. One day we did the Kalami to Menegoulas loop, described by Gillian Price as an ‘excellent if tiring circuit above the north eastern coast’ in her Cicerone guide. The other day we got the bus into Corfu Town: busy with two fortresses, lots of Venetian buildings and great views across to Albania and inland to the hills and Mt Pandakratoras. The route is way marked but there are gaps and tricky bits. We used the Cicerone guide by Gillian Price, the freytag and berndt 1:50,000 map which marks the trail and instructions from New Experience Holidays. Download a street plan of Lefkimi so that you can plot your way through; it is in effect five coterminous villages and quite hard to navigate. New Experience Holidays booked accommodation. Arrangements on Corfu were made by Anna Apergi Travel and Tourism a local family firm. They were always helpful and everything worked well. Stock up with water each day. Six 1.5 litre bottles can be bought at mini markets for two euros or less. ‘Walking the Corfu Trail’ by John Waller is an amusing account and reflection by an English migrant and friends: strong on food and flowers but not really a trail guide. ‘My Family and other Animals’ by Gerald Durrell is well worth a read ( as is Laurence Durrell’s ‘Prospero’s Cell’;) they give amusing and idiosyncratic perspectives from an eccentric upper middle class family in the late 1930’s before mass tourism – among other things – transformed the island. Coast to coast is a really good walking challenge and gives a marvellous perspective on the diverse landscape and social history of this slice of northern England. I’m recently back from completing it along with my longstanding friend, Chris. 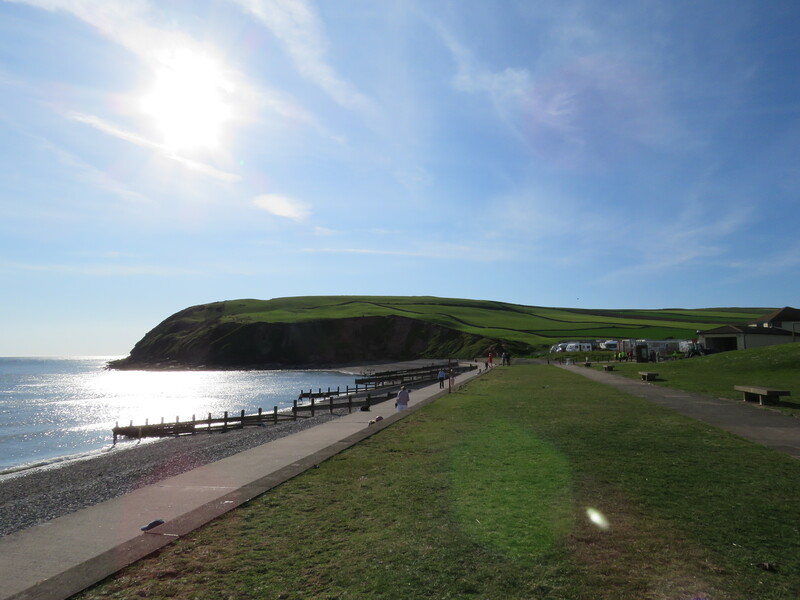 Leaving St Bees on the West coast, it starts with a short stretch of coastal path then gradually begins the crossing of the Lake District, taking in three high passes alongside some of the area’s major mountain peaks. It then follows a limestone plateau to reach the northern Pennines winding down Swaledale before crossing the Vale of Mowbray and tackling the northern side of the North Yorkshire Moors, ending with another stretch of coastal path to reach Robin Hood’s Bay on the East coast. 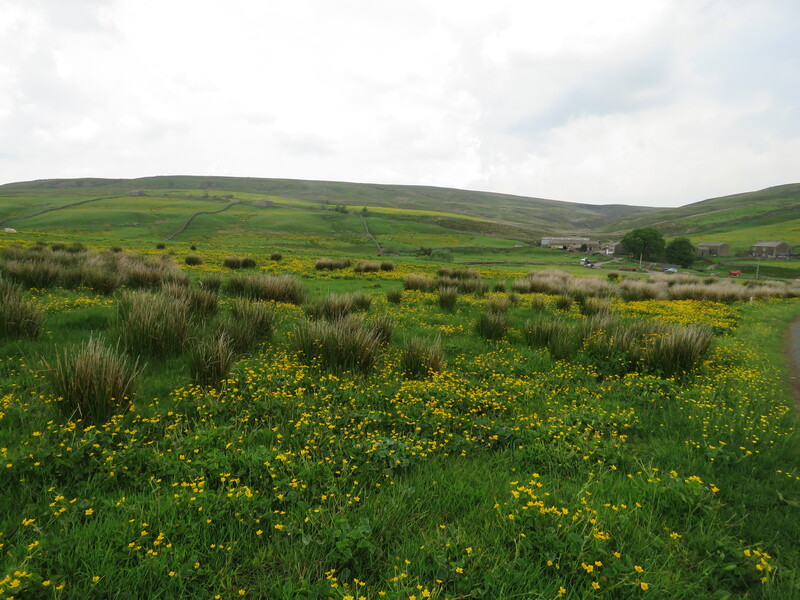 I was already familiar with some areas visited but doing it this way gave a fresh perspective seeing the landscape gradually change and approaching moors and valleys from a new direction. Alongside the beauty and variety, the walk is hard work and at times the emphasis needs to be on ‘pushing on’ and reaching the day’s destination rather than exploring and appreciating the surroundings. Totalling nearly 200 miles, completing in twelve days means 15+ miles a day sometimes covering difficult, if not technical, terrain. 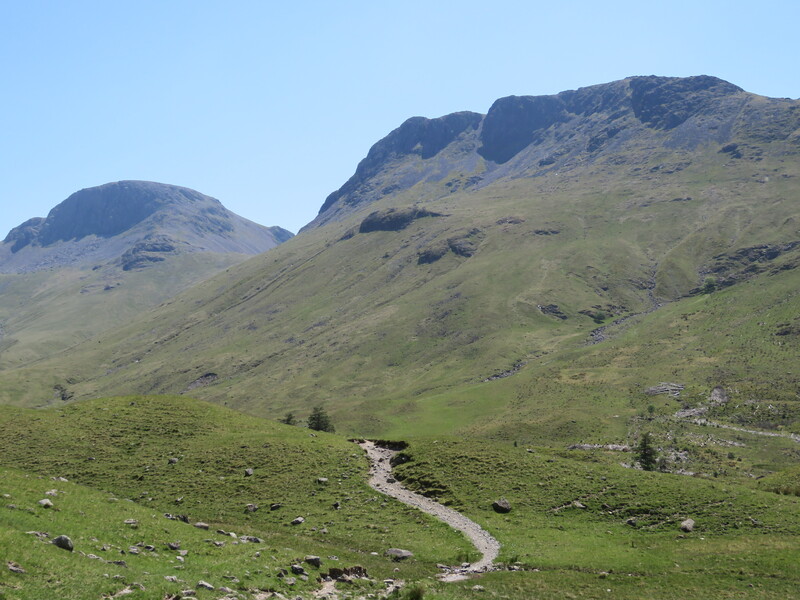 The part through the Lakes is the most dramatic and toughest going with steeper ascents and the hard stony ground putting pressure on feet and joints. Several of the days involved 8-9 hours walking although a few were almost half that. I had my 69th birthday on the second day; I’m a practised fell walker but not an athlete! This is to give an idea of the walk’s appeal and variety- there are many guides to provide detail and find the route; guide authors often have their own idiosyncratic take on the walk and what are the best bits. I used the Cicerone one which worked fine; it uses extracts of OS maps and includes useful contextual information. 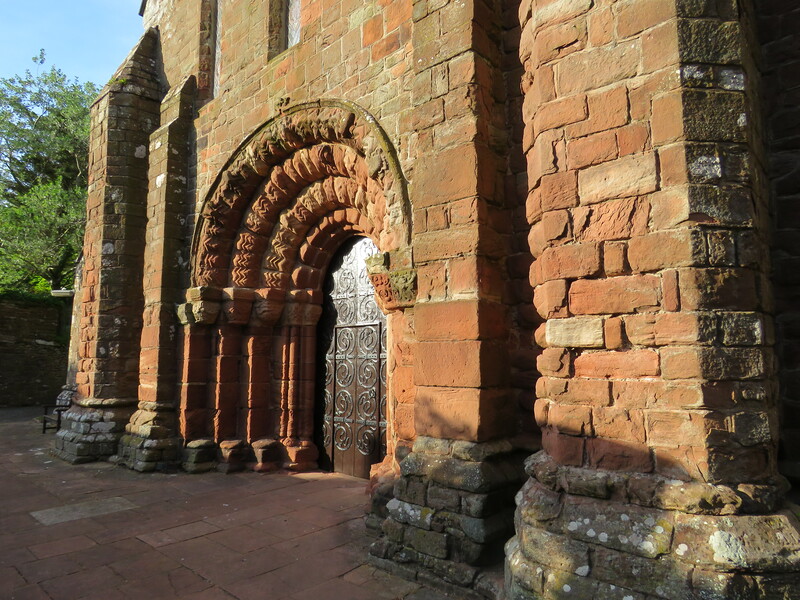 Western coastlands: along the coastal path for a few miles with fine views of the Isle of Man and Galloway, leaving it at a quarry, the distinctive red sandstone having been used for many local buildings including the church and school at St Bees. Then following paths and lanes across agricultural land and former mining villages; gradually the terrain changes and the Lakeland mountains come into sight. The Lake District: begins by skirting Ennerdale Water and then a slow ascent to Black Sail pass and Youth Hostel. The days in the Lake District include several long ascents and descents with excellent views of some of the main peaks and groups of fells including the highest, stoniest and sharpest central fells and the gentler grassier slopes of the far eastern fells. After Black Sail there is a splendid view of Great Gable and Pillar (see pic) and later (having climbed by Loft Beck) the Western fells and Buttermere and Crummock Water. After Borrowdale a steep ascent to Greenup Edge and a long descent to Grasmere before ascending to Grisedale Tarn (with Dollywaggon Pike one side and Fairfield the other) and then down to Patterdale. The last day in the Lakes ascends the far eastern fells towards High St (with good views back to Patterdale and Ullswater if the mist allows), heading East before reaching the summit and heading east for Kidsty Pike (the highest point of the walk at 780m) and then descending to Haweswater, a reservoir. 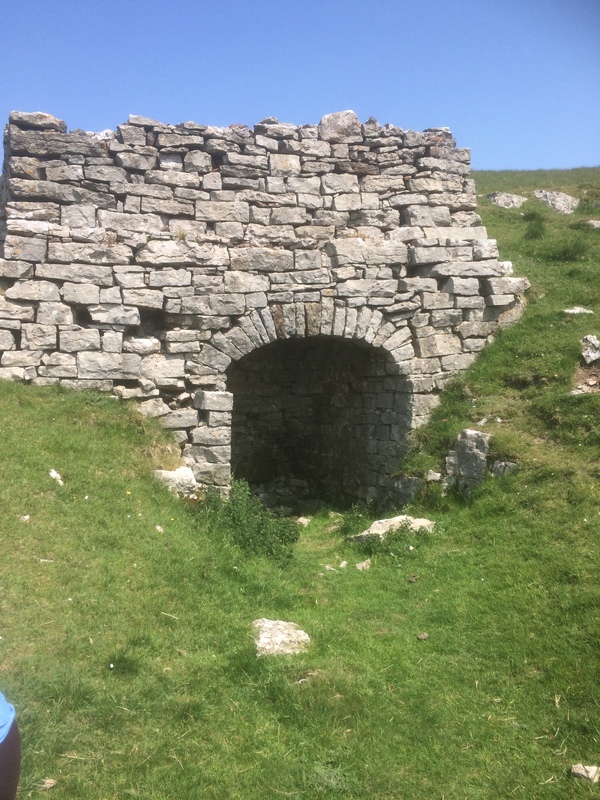 Limestone country: for the time being the steep climbs are over and the route crosses milder limestone country with views of the Lakes to the West, the Pennines to north and east and Howgill fells to the south. The terrain is not flat but undulating with dry stone walls, sheep grazing, limestone escarpments and valleys. It is much less busy than the Lakes where there are always plenty of walkers, whatever the weather. The route goes through two market towns – Shap and Kirkby Stephen – that were on important historic north-south trade routes. 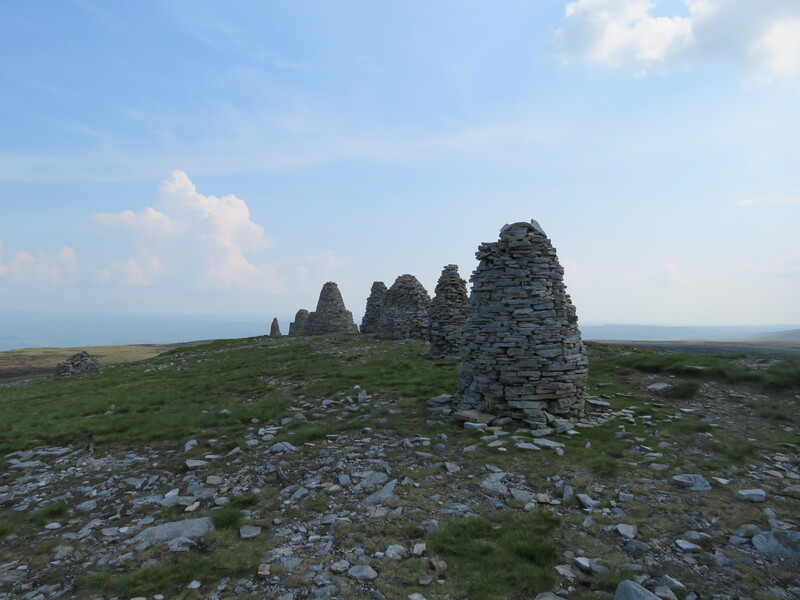 firstly ascending to the Standing Stones (above) (and lies on the watershed of Britain) and then with classic Pennine walking across marsh, peat bogs and grouse shooting terrain to reach the head of Swaledale. The Swale is followed for twenty plus miles with a pleasant mix of riverside, field and moorland walking; gradually it becomes less remote, gentler and more populated reaching the prosperous market town of Richmond. 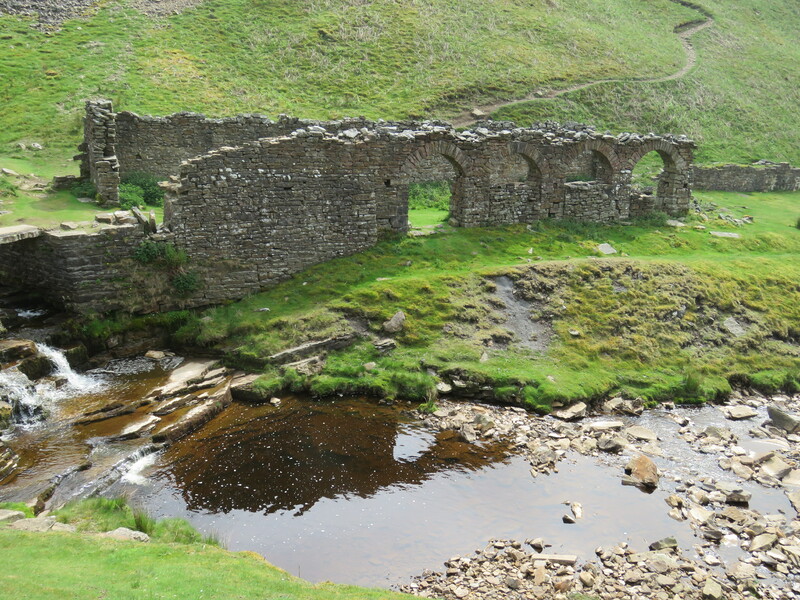 For the first half, as far as Reeth, there is an alternative high level route that takes you though the former lead mining area; tougher – especially in bad weather – but rich in evidence of the valley’s industrial importance in the 19th century. The crossing from Richmond to the edge of the North Yorkshire Moors at Ingleby Cross is 24 miles mainly of field walking with some minor roads, including a detour to cross the A1 (being widened) and a scary crossing of the A19 right at the end. The vale is flat and can be covered quite quickly (10 hours including breaks and one or two minor detours). For many this is a ‘push on’ stage although some may appreciate a predominately flat and agricultural stretch. 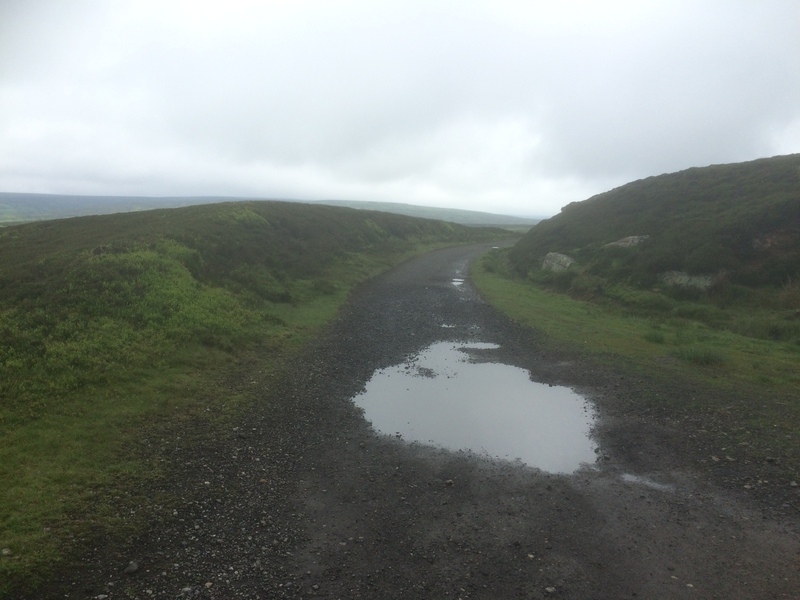 A fine stretch of walking initially with a lot of ups and downs and then long stretches of higher moorland following tracks and disused railway lines surrounded by heather with views across the moors and down valleys. The final stretch, from Glaisdale, leaves the main moor behind and mainly follows valleys before ending with a short walk along the coastal path to reach Robin Hood’s Bay. It includes a wooded walk along Littlebeck passing the magnificent waterfall, Falling Foss: scenic but very muddy following rainfall. This is a popular walk and you meet many others on your way including lots from North America and Australia as well as the UK. It’s reassuring to check the route with others (many now use GPS) and hear the different attractions and backstories that led people to do it. We met many fellow ‘baby boomers’ who thought it ‘demanding but doable’ and particularly liked the variety of landscape passed on the route. 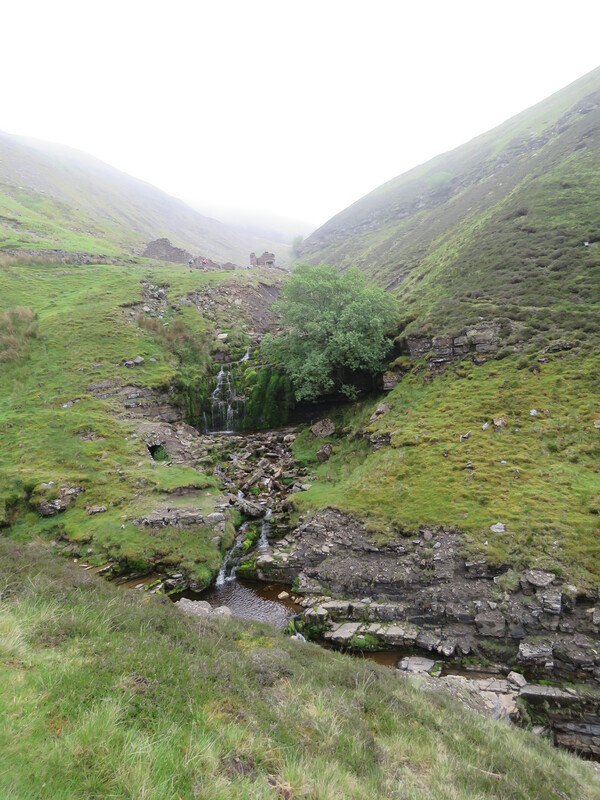 We did it in twelve walking days with overnight stops as follows: Ennerdale Bridge, Rosthwaite, Patterdale, Shap, Kirkby Stephen (+ rest day), Keld, Reeth, Ingleby Cross, Claybank Top, Glaisdale. A number of organisations assist with the logistics such as transporting your main baggage, booking accommodation and safe car parking. We used Sherpa Van Project for baggage and booking and the service was faultless. 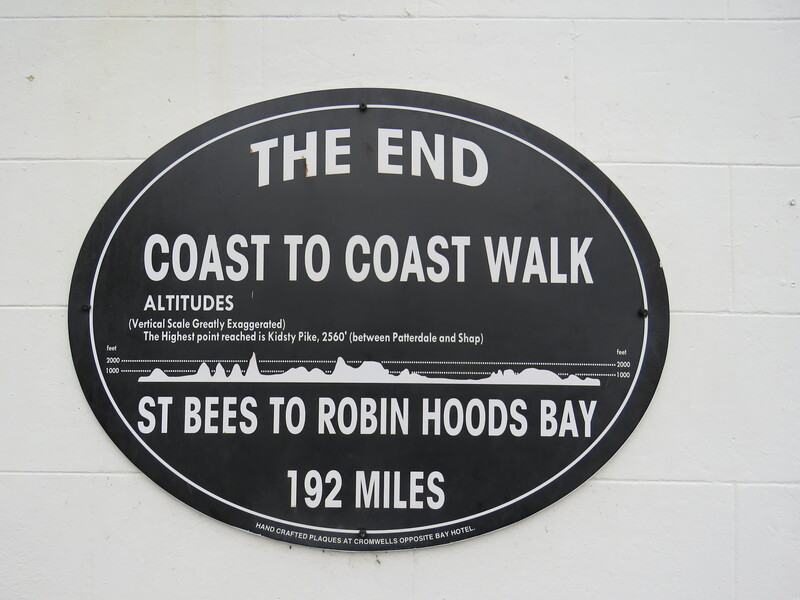 B&B, pubs and small hotels en route have benefitted from the steady stream of coast to coasters and in turn cater well for walkers. Some a few miles from the route will pick you up and return you to the path. Some brave people backpack and camp. How many days? People we met varied between eleven and sixteen days walking. It’s quite common to take four days from Ennerdale to Shap and stop in Grasmere, perhaps including a few peaks between Borrowdale and Patterdale. Some cross Mowbray Dale in two days usually stopping at Danby Wiske. We did meet some, particularly backpackers, who said they’d take ‘as long as it took’- backpacking gives extra flexibility but at the cost of carrying a substantial weight. Today much of the rural economy on the route is based on agriculture and tourism but you see ample evidence of a different social and industrial landscape during the industrial revolution and Victorian times. There were large mining communities in the West (coal), Swaledale (lead) and Rosedale (iron ore) as well as quarrying for stone and slate; there’s a large slate quarrying visitor centre at the top of Honister Pass. In addition there are many disused railway lines that had connected mines to urban centres. The walk across the North Yorkshire Moors includes a five mile stretch of the former Rosedale railway line. 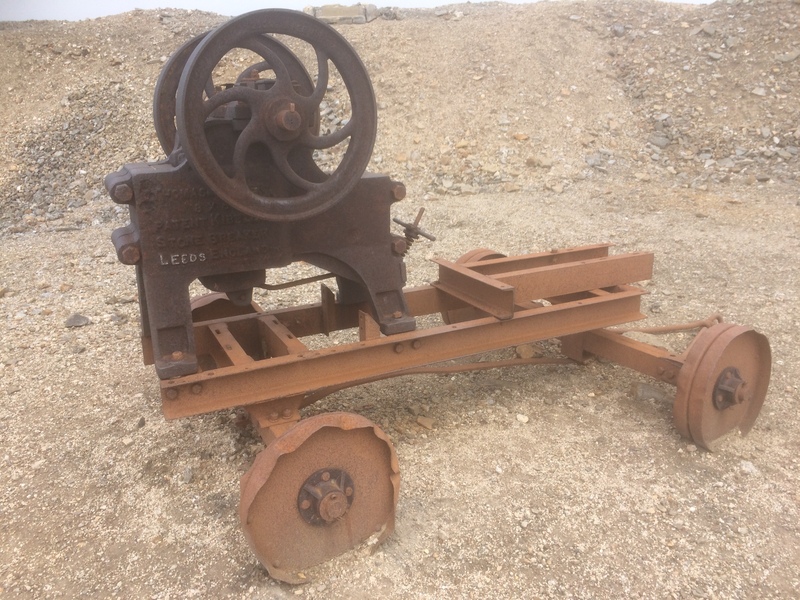 This was built to transport iron ore from the busy Rosedale mines (peak production of 560,00 long tons in 1873) to the main railway line and then on to Durham smelting mills. The concept of Social Purpose Education (SPE) is important within adult education and stretches back at least a century. It expresses the commitment to social change and action and signifies a distinctive strand of adult education, contrasting with that with a primarily academic, vocational or leisure purpose. This couldn’t be more relevant today. The revival of the term in the WEA, Northern College and elsewhere in the residential and voluntary sector is a most welcome antidote to the decline in liberal adult education and overwhelming focus on ‘vocationalism’ and qualifications. It demonstrates our striving to maximise the social impact of our work and restate the vital importance of adult education in building a better and equal world. And yet the meaning of the term is hard to pin down; many adult educators would sign up to it but would explain this in different ways ranging from a broad commitment to combating disadvantage through to education as a committed and integral part of a social movement. I want to look at how the term has evolved and how best it could be understood and built in today’s complex and diverse society. My starting point here is an article written in 1949 by Sydney Raybould, who was Professor of Adult Education at Leeds University which had a large and influential Extra Mural Department working closely with what was then the Yorkshire North District of the WEA. Raybould noted that ‘there is a good deal of vagueness, or lack of agreement, as to what it (education for social purpose) actually means.’ To him it meant ‘education that helps students to understand the society in which they live, and to change it in ways that seem to them desirable.’ He was driven to make this clarification by a concern that the social purpose education tradition of the interwar years was being undermined by shifts both in subjects and standards. He felt that economics and industrial relations were the subjects most likely to appeal to the students the WEA wanted to attract and that the growth of provision in other liberal arts subjects (whilst not in itself a bad thing) undermined this focus. Raybould was also an intransigent defender of academic standards; these required long courses (tutorial classes met over three years), regular attendance and written work. He seized upon the phrase ‘pipe and slippers’ attitude coined by the young Richard Hoggart to describe a growing and not uncommon approach to teaching literature. The high watermark of this brand of SPE is often seen as 1945 signified by the large numbers of MPs, local councillors and trade union officials and leaders whose formation had included WEA and university adult education. However Raybould in 1949 was fighting a losing battle as liberal arts and humanities courses grew in popularity at the expense of social sciences, shorter courses came to predominate and written work by students was an optional extra. The social purpose tradition continued in trade union education, particularly through the three year day release course in mining and some other nationalised industries and through the WEA’s trade union scheme. However, the 1970’s saw a renewal of social purpose education as part of the of new social movements amongst women, tenants, inner city residents, unemployed adults, trade union health and safety activists and others. The education, often informal, benefited from connections with and support from the expanding community development initiatives. These were often sponsored by central government to support policy objectives such as political engagement, social cohesion, neighbourhood renewal, job creation and public service reform. Particularly important is the powerful emphasis on a ‘student centred’ pedagogy in which knowledge and curriculum are developed between students and tutor rather than provided by the tutor from an existing body of knowledge. There is also an assumption about shared values and sense of what change would be desirable. The previous commitment to ‘balance’ (in theory at least) is no longer there although the stress on ‘critical understanding’ presumably requires debate and contrasting view points. Still present is the link to social action/changing society but here it’s framed differently reflecting the fragmentation and diversity of modern politics. Interwar adult educators appeared to share a picture of political parties, local and national government, trade unions and other large voluntary organisations as constituting the political process. Community development started from the local and specific, recognising the range of social action and political engagement. This is well illustrated by Take Part, a New Labour initiative that sponsored community education initiatives with a diverse range of mainly local groups but with a common thread of ‘learning that enables people to make an active contribution to their communities and influence public policies and services’. I hope I’ve shown an evolving tradition with important elements that should be retained and developed: the power of education as a contributor to social change; the centrality of experiential and student centred learning; the necessity of critical understanding to change society; the need for education to relate to social movements and organisations. At the same time the contemporary challenges are considerable. There is a continuing scepticism about the mainstream political process with membership of political parties and voting declining. Union membership is falling. Social movements are not disappearing (witness the enormous courage and impact over 20 years of the Stephen Lawrence and the Hillsborough families’ campaigns) but they are more fragmented and diverse. Many too work with social media and other forms of digital communications, media with which conventional adult education has not yet effectively caught up. In addition central government policy towards community development has hardened: government funding initiatives favour lean and sustainable delivery models, often using volunteers and with an emphasis on business partnerships and sponsorship. Furthermore public expenditure cuts have led to a drastic reduction in the numbers of local community development-type roles such as parent link workers in schools. The scope for a discrete strand of SPE, separate from ‘mainstream’ adult education is greatly reduced. So how do we develop large scale SPE in the current circumstances? A starting point has to be a rigorous focus on members of disadvantaged communities. This reflects the continuing commitment to equality throughout the whole SPE tradition and is particularly important now, at a time of squeezed resources. However whereas earlier SPE focused on organisations and groups, today’s appeal will mainly (not exclusively) be to individuals who can be attracted into adult education provision. Experience says that this is most effective when we address people’s immediate interests and concerns where they have, as they often do, a potential link to SPE. This may be to speak English better, to improve fitness or manage a health condition, develop literacy and numeracy skills, learn craft and digital skills or be better able to support child or grandchild development. It is topics such as these that often persuade disadvantaged adults to take the plunge into adult education. SPE requires us to find the ‘point of connection’ between these direct concerns and wider social context and action. These don’t exist in watertight compartments after all. For example work on a physical fitness class will often present questions about opening up of leisure facilities for particular groups or improving public health facilities, for instance by providing gym equipment in public parks. Practical activity learning English makes students confront issues of prejudice, racism and insensitive public service delivery. It is important that ‘social purpose’ isn’t a ‘hidden curriculum’ revealed by the tutor to unsuspecting students but something that grows organically out of active and experiential learning. Small scale projects are a well-established way of enabling this to happen as they give the opportunity to explore a topic of great interest to them; often this transforms understanding from the personal to the social. Research, for example, into support for a disabled child may well open up a whole set of issues around the treatment of disability in today’s society. This line of argument will be recognisable to many adult education practitioners who can provide rich and varied examples of SPE outcomes. The challenge though is to raise our game ensuring good SPE outcomes for as many students as possible and documenting this as part of establishing SPE as a vibrant, respected and widely known part of post 16 learning. The recent policy focus on impact analysis as part of the rationale for public funding provides a key as to how this can be done. Follow up research done earlier this year by BIS, and by individual providers like the WEA, revealed some fascinating outcomes such as that over 20% of community learning participants had become involved in voluntary activity as a result of their course. This creates the opportunity to decide more specifically the SPE outcomes that are being sought and refine research strategies to track the progress of particular groups such as how far members of deprived neighbourhoods are – as a result of SPE – taking part in community or political action. Reflecting on what students do and do not achieve is revealing and can in turn inform curriculum development. For example the WEA found that English language courses in one area had very positive employment outcomes; this identified the scope for providing an employment ‘record of achievement’ for students and really consolidating this link. My conclusion is that SPE is a living tradition but one that needs continually recreating. Contemporary society is diverse and uncertain; there are rich opportunities to create a modern Social Purpose Education and it is vital that we do so. R.H.Tawney was a big contributor to the development of workers’ education in the first half of the last century as well as an important and influential social historian and left-wing political figure. I’ve just finished reading an excellent new biography of him by Lawrence Goldman and strongly recommend it. Particularly interesting to me are Tawney’s early years and his innovative work in developing tutorial classes for working class students in the early part of the 20th century, a formative period for the labour movement and workers’ education. Tawney was appointed by Oxford University as tutorial class tutor in 1908 when he was in his late twenties and charged with teaching classes in Stoke and Rochdale, summer schools in Oxford and writing a book on early modern history. Tutorial classes were a major initiative arising as part of the drive by some Oxford academics, the newly formed Workers’ Educational Association (WEA) (Tawney joined the WEA in 1905 and was soon on the Executive), along with labour movement and church figures to ‘widen participation’ in university education, particularly Oxford. They comprised a course of sustained and purposeful education undertaken over three years of weekly classes. They benefited from some public funding subject to minimum numbers of students attending at least two-thirds of the meetings and ‘doing such written work as may be required by the tutor’ This was the beginning of the ‘golden stream’ of public funding for adult education, fortunately still extant today. Tawney had already knowledge and experience of adult education through the work of the Settlements and University Extension lectures. However tutorial classes allowed for more thorough and systematic work and to engage with organised workers as opposed to the disorganised urban poor or the middle class. 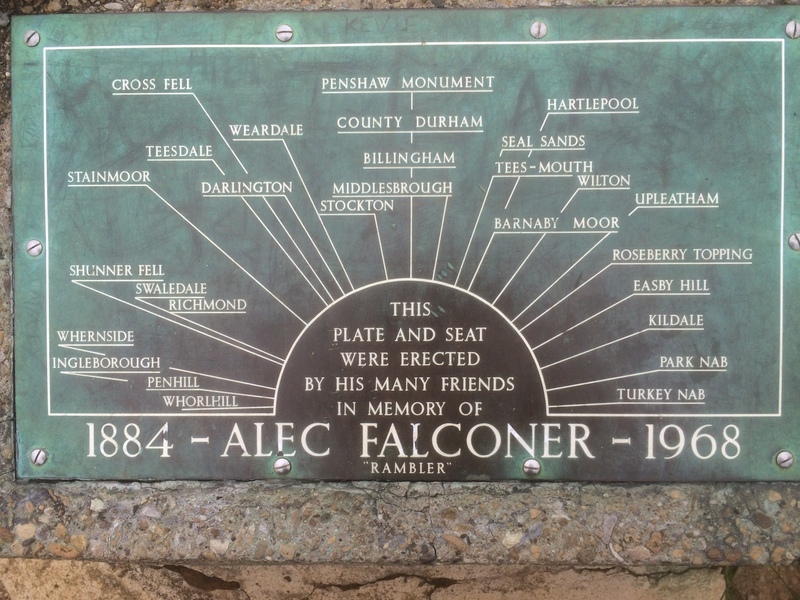 ‘The genius of English workmen for organisation has covered some of the districts of northern England (for example Lancashire) with a network of institutions, industrial, social, political and religious…There are certain towns in which almost every adult appears to a stranger to be connected with half a dozen different associations. It is obvious that the common atmosphere thus created is favourable, like that of an Oxford college, to the dissemination of ideas.’ (Tawney, quoted in Goldman p 54) The WEA was part of this network of labour and co-operative organisations; they provided the students and were able to select the subject and – to an extent – influence the curriculum. At the same time, Tawney’s vision was a predominately male one. In his largely sympathetic assessment and review of Tawney and his critics, Goldman concludes ‘Tawney’s signal weakness was…a particular type of insensitivity or blindness with regard to women and their place in society’. For example, Tawney, relating an evening’s class to his wife reported, ‘…there’s enthusiasm for you. But I’m afraid the ladies, mainly school teachers, felt rather left out in the cold, as the discussion after the class is usually dominated by enthusiastic socialists’. In the iconography of tutorial classes manual workers play a predominant part but elementary school teachers and routine white-collar workers were also important participants. Tutorial class became associated with a particular teaching method based on an hour’s lecture followed by an hour’s discussion. A student described Tawney’s approach as being to begin with ‘the presentation of the factual detail’, then ‘give you the case for and against’ and then sum up. Wherever he could, he taught from the sources. Then followed an hour’s discussion in which class members, that would include young members of the Independent Labour Party and Social Democratic Federation, would ‘go for Tawney like a bull at a gate’. He though refused to be drawn on his interpretation of events. This notion of ‘balance’ was integral to the WEA’s idea of liberal education and the development of independent critical thinking amongst students. It was strongly criticised by the Plebs League and Labour Colleges (whose tutors taught from the viewpoint of a particular brand of Marxism) and others such as George Lansbury, who became a left-wing Labour MP and leader of the party. Tawney did though point out that socialists predominated in all classes and many students had said how the WEA had helped them in the labour and trade union movement. These principles of tutorial class teaching became widely adopted but it’s worth reflecting upon Tawney’s particular impact; a young, eccentric middle class Oxford academic with a rare ability to inspire many of his students and build a thriving learning community. To him tutorial classes represented a micro version of the sort of society for which he strived. Recollections by former students present a picture of a charismatic tutor. One of his former students writes of his ‘nobility’, ‘I don’t think I’ve ever met a more humble yet at the same time a more noble creature’. This charisma went alongside an egalitarian and at times self-deprecating style, mixed with an authentic interest in his students’ experience. Tawney was clearly able to draw out and learn from their experience and he acknowledged this in his scholarly work. The subject of the bulk of Tawney’s classes was 18th and 19th economic or industrial history. Why? He was not trained as a historian, in fact history was just emerging as an academic discipline at Oxford and his own research and writing focused on an earlier period. His idea was that by studying the creation of their communities, working class students would be better placed to understand and change their current conditions. In a sense this was the beginning of the ‘social purpose’ curriculum espoused by WEA and university adult educators in the inter-war. Finally I want to reflect on how Tawney saw workers’ education within the wider education system. Whilst an influential and formative innovator within workers’ education, he did not see this as a discrete area of educational activity. The tutorial classes’ movement was conceived as part of opening up Oxford University, replacing the ‘idle pass men’ with talented working class students. He campaigned vigorously for this attracting considerable notoriety, as well as praise. His teaching experience vividly brought home the limitations imposed by inadequate schooling and long hours of heavy work on people’s capacity to study. His response to this was policy and campaigning work for universal secondary education, the raising of the school-leaving age and improved working conditions. Tawney was one of the greats of workers’ education in the first half of the last century. Goldman’s book, drawing on much previously unused source material, provides a fascinating ‘warts and all’ study. It’s great that leading experts recognise the importance of adult and further education in combating health inequalities; this is highlighted in one of nine contributions to ‘if you could do one thing…nine local actions to reduce health inequalities’ produced recently by the British Academy. The authors, Tarani Chandola and Andrew Jenkins, draw on extensive published research to show the positive link between participation in education and improved health. Importantly they suggest that improvements are greatest amongst adults with the least educational qualifications and that vocational, qualification-bearing and ‘leisure’ courses all play a part. Provision needs to reach different disadvantaged groups including unemployed as well as employed and old as well as young. They stress that to be successful adult education must address the barriers amongst the least well off; this includes financial and accessibility issues as well as confidence and the need for education to be seen as relevant. Their study concludes by summarising two successful initiatives, one training staff in care homes to provide educational activities for residents and the other enabling doctors to prescribe access to an educational adviser for some of their patients. The Workers’ Educational Association (WEA) is excellently placed to work in partnership with local authorities who wish to further develop their work in this field. Whilst we recognise that resources are tight, initiatives such as these can greatly benefit residents, support local authority priorities and lead to significant savings on health and social care. Our own follow-up ‘impact research’ supports Chandola and Jenkins’ conclusions. An in-depth study of former students undertaken in 2013 found ‘Nearly all respondents (98 percent) reported a positive social or health impact as a result of doing their course. The majority (87 percent) noted the course had kept their mind and body active which rose to 94 percent in those with a long-term physical or mental illness.’ In addition there were hundreds of individual stories attesting to how WEA education helped students work through life crises (such as bereavement), overcome isolation and depression, develop healthier lifestyles and manage existing conditions. We strongly agree too about the necessity to target and shape educational initiatives around the most disadvantaged and vulnerable groups in society. Importantly, adult education recognises and can build on existing knowledge and understanding, a ‘community asset’ approach rather than a deficit model. We have a long and successful tradition of working with community leaders and organisations to engage local people in education that’s useful and relevant to them. Examples include Tandrusti and similar projects in the urban West Midlands that involve thousands of adults, mainly from BAME backgrounds, in tailor-made physical activity and health educational programmes. For example during 2007-2012 over 95% of participants in our Tandrusti programme reported health maintenance or one (or more) health improvement , for example in reduced blood pressure, weight loss and waist circumference. Measurable improvements in confidence, mental health and community cohesion are also frequently recorded. The impact extends beyond course participants as it’s cascaded to family members, friends and others in the local community. WEA educational programmes work well in partnership with local authority health and well-being priorities such as reducing the incidence of obesity and diabetes and increasing physical activity in the local population. The impact on the individuals is often long-term improving ‘health literacy’ and enabling people to manage their health and life styles more effectively. Benefits accrue to the local population as a whole reducing pressure on GP surgeries and A&E departments. The WEA is the UK’s largest voluntary adult educational organisation and volunteering can play a vital part in health improvement education. A recent project in partnership with St Luke’s Hospice in Plymouth saw the WEA train and support volunteers and Hospice staff in providing an imaginative and widely praised programme of ‘creative well being’ education. This model is recognised as being widely transferable. There is a rich experience and expertise here that can greatly assist local authorities’ efforts to reduce health inequalities. Adult education pedagogy: lectures and discussion? Lots of adult education classes, particularly in the arts and humanities, are lecture based and they’re popular with some classes and particularly older students. A well presented lecture gives students an opportunity to hear and see an enthusiastic expert, even a celebrity, develop an argument that can engage and stimulate a serious interest and debate in the subject. The presence of the web has greatly increased the availability of lectures. Many MOOCs (Massive Open Online Courses) provide a series of lectures as their core; TED offers an attractive playlist of virtual lectures, many by well known experts; etc. Lectures are an important part of adult education but in my opinion they can only form part of a learning programme especially given the student centred ethos of adult education. Early WEA tutorial classes included a lecture, class discussion and independent work by the student producing an essay which in turn received assessment and feedback. In most educational settings (Universities, FE colleges etc) this sort of mix would be the case: lecture, seminar, essay or other assessed work. However in much of post-war adult education, student written work withered on the vine; tutorial classes became shorter (one or two terms rather than three years) and the requirement for written work was dropped. Writing is about learning as well as communicating. It gives the opportunity to take hold of ideas and arguments and refine and develop one’s own understanding and perspective. The process of drafting and redrafting (admittedly often painful and time consuming) enables this to take place as well as producing a piece of work for individual feedback from the tutor. It’s true that many adult education students have continued to do independent work outside the classroom, quite a considerable amount in some cases including researching, preparatory reading, visiting museums and galleries, and getting involved in local societies and organisations. And, from the 1970’s there were new opportunities, such as the Open University and expanding adult provision (like Access courses) in Further Education, for adults seeking an accessible and academically challenging education. Discussion was always an important part of the tutorial class tradition, very effectively used by historians like Tawney to draw out students’ experience and enrich their and his understanding of the subject. It is interesting too to see how the young Raymond Williams (who became an eminent Marxist cultural theorist) approached this as a WEA /Oxford University literature tutor in East Sussex in the 1950’s. He abandoned the existing approach based on literary criticism and instead asked students to read and discuss the texts, or extracts from them. Complaints were made about Williams because he would often remain silent until a student instigated discussion rather than speak himself. Adult educators have accumulated a vast amount of experience in addressing these sorts of issues through class discussion and particularly through the use of small group work. The latter gives greater opportunity for each student to participate, ask questions and test out ideas and doubts. It’s a good way to draw out students’ experience and existing knowledge and skills. It can be used to develop listening, summarising and reporting skills and enables the group to put forward collective responses. Reporting back enables the tutor, and other groups, to give feedback and comment. Used effectively it can shift the tutor/student power relations towards a more collaborative effort and enable the course as a whole to have ownership of things like ground rules. Returning to the original question, I think lectures are best used to spark and shape student engagement, encouraging questions and an exploration of the information and argument provided. A mini lecture (10-20 minutes max) can set the scene, outline an argument (or range of arguments) and then present questions for students. This approach could be extended to virtual lectures and learning circles using group discussion methods to explore and respond to the issues raised in the lecture. The role of the lecture is still a live issue in adult education, including the WEA, and I would be interested in other people’s perspective on this.